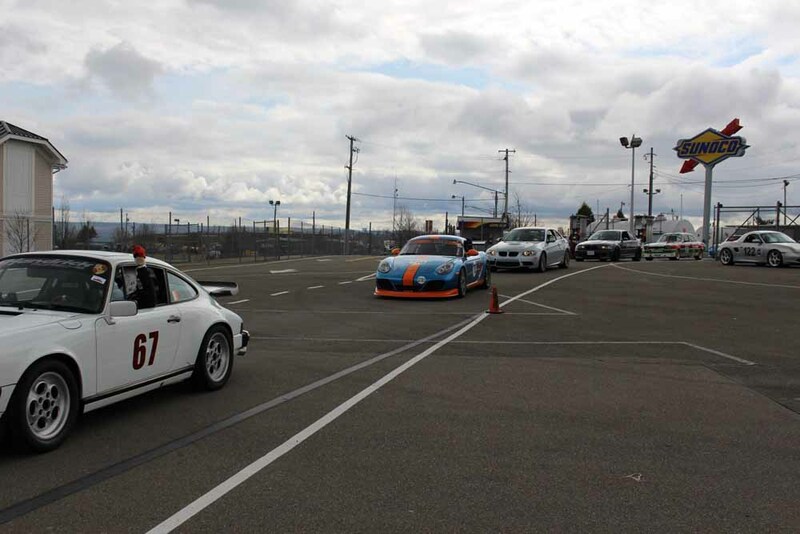 PCA drivers’ education has earned a reputation for being one of the safer venues for gaining on-track experience due, in part, to very clear rules about passing. There are strict guidelines that must be followed by both the overtaking (following) car and by the overtaken (leading) car. 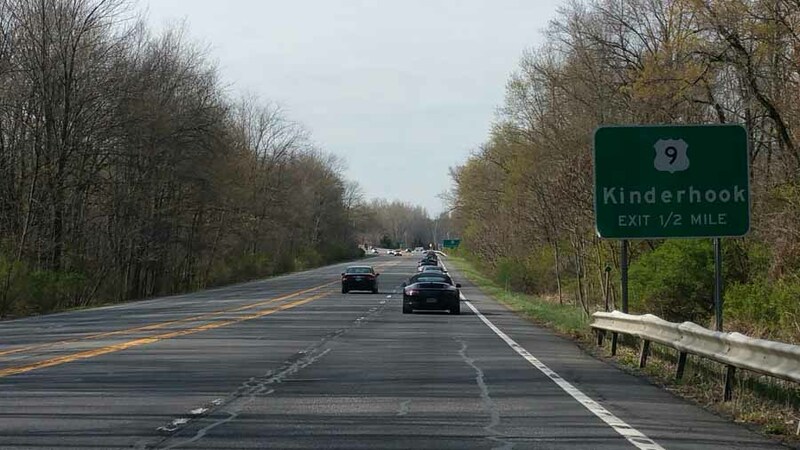 This way, “both” drivers know what is expected of them, and both drivers understand the steps needed to complete a safe pass. One such example is knowing the locations of the “passing zones” – the straight sections where the pass will occur before entering the next corner. The crux of the passing scenario is the: passing signal. This is a physical gesture from the leading driver to the overtaking driver, and it accomplishes two goals. First, it tells the overtaking driver that the leading driver is aware of his or her presence and will play an active role in the pass (more about this part in a minute). Second, the signal is an indication of which side of the car the leading driver wishes the overtaking car to go. A signal where the driver in front sticks his or her arm out of the window and points with a finger over the roof towards the right (passenger) side of the car is a gesture that means: Hello car behind me. I see you and would like you to overtake me on the passenger’s side of my car. I will adjust my speed accordingly so you can complete the pass and be in front of me for the next braking zone. Boy! That’s quite a mouthful for a movement that doesn’t take more than a second or two to complete! But, in actuality, hand signals are a very effective way to communicate with others in a loud environment where things happen quickly. Let’s pause for a moment and revisit the last part of the hand signal translation – the “I will adjust my speed accordingly” bit. This is very important, and, along with giving the passing signal, it is the most important responsibility of the driver that’s being overtaken. 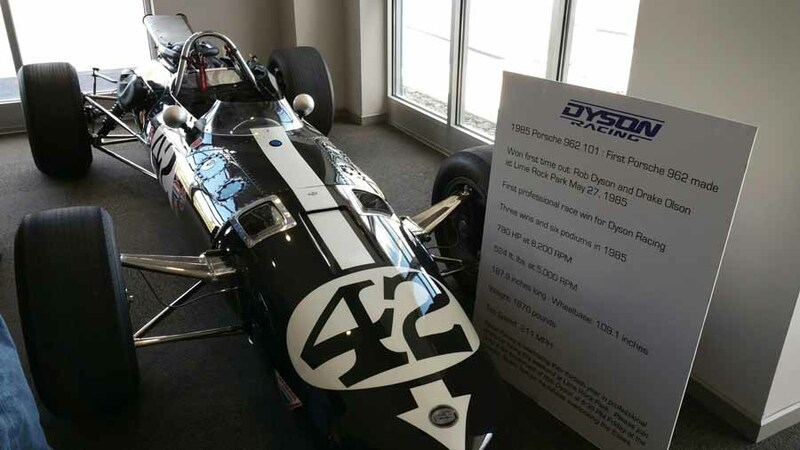 Due to a variety of factors, ranging from car capabilities, tire selection, suspension setup, driver ability, and so on, the car that is overtaking might not have the horsepower to pass the front car without the front driver easing off the throttle a bit. 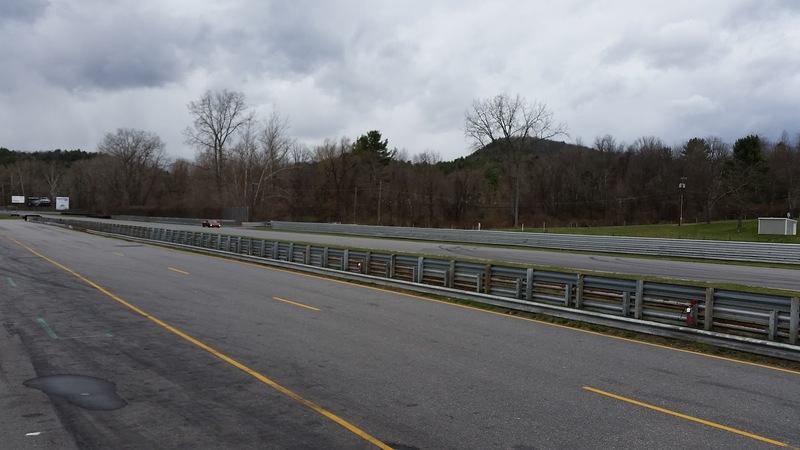 The majority of tracks we use for DEs have more turns than straights – a car that can go faster around the curves will have a lower lap time, and thus will need to pass at some time, another car that has higher straight line speed, but less cornering speed. Along with a clearly executed signal in the correct passing zone, the driver in the leading car also has to plan ahead to determine “which” side the overtaking car should pass on (a reminder: over the roof for a pass on the right, and straight out the window for a pass on the left). The car that is being passed should stay “on line” coming up to the next corner – and should allow the overtaking car to pass “off line”. For example, if the passing zone ends with a right hand corner, the proper “turn in” point will be at the left edge of the track. This means the leading car should stay to the left – and the overtaking car should pass on the right. If the passing zone ends in a left hand turn, then the overtaking car should pass on the left to allow the first car to stay on line at the right edge of the track. Remembering and understanding these guidelines will maximize safety and give everyone the opportunity to have a great event. I’ll meet you at the apex! 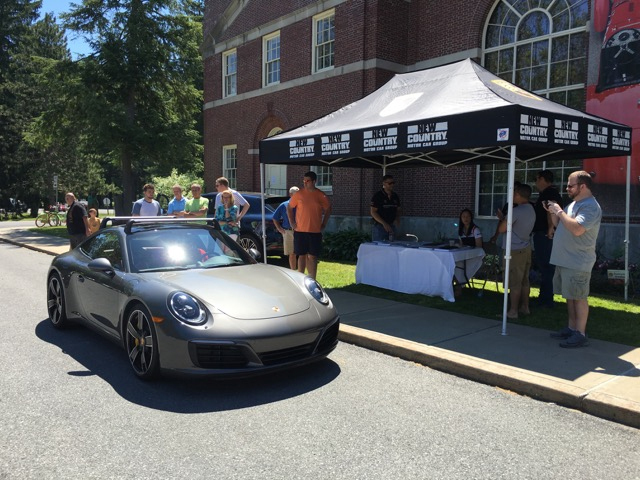 HCP members opened their checkbooks and wallets, contributing $857 to Guiding Eyes for the Blind and the Northeast Regional Food Bank at our 2016 June picnic. According to Sharifa Perry who coordinated the event, the charities will be able to use the all-cash donations to best meet their needs. 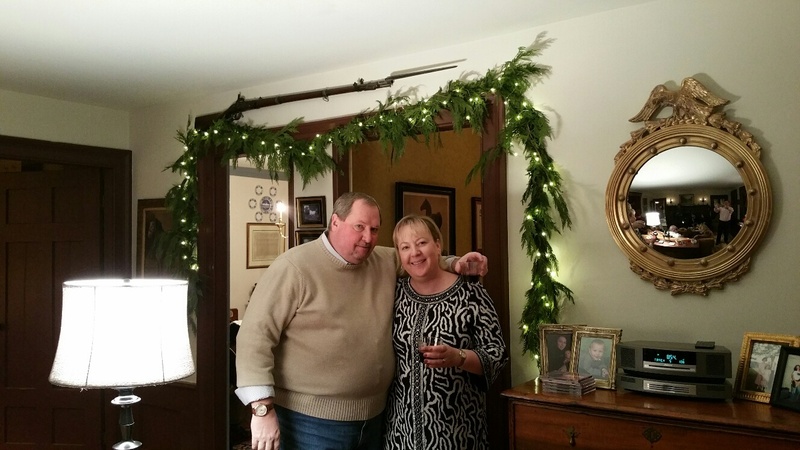 Donations were almost evenly split: Guiding Eyes received $435; the Food Bank received $422. July Drive & Dine – Saturday July 23, 2016, 6:00A.M. – ?:?? 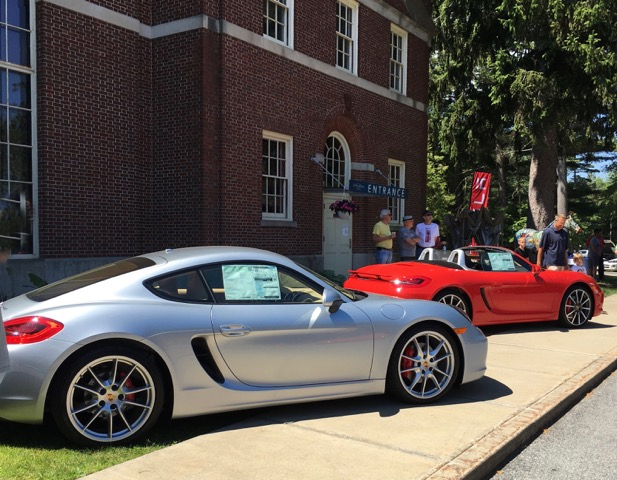 P.M.
Drive to Lime Rock Park Porscheplatz hospitality tent to watch in comfort the 2016 IMSA Weather Tech Sportcar Championship Race, then finishing the day with a optional meal at Black Rabbit Bar and Grille. This event will start at Cracker Barrel of East Greenbush at 122 Troy Road (Exit 9 of I-90) ( http://locations.crackerbarrel.com/ny/east-greenbush/317/ ) at 6:00AM for a optional breakfast. We will leave this location at 7:00 AM sharp! (If you do not want breakfast) We will head south to Lime Rock Park Porscheplatz hospitality tent which includes: Track side viewing at West Bend, Live exclusive large screen TV coverage, Complimentary cold beverage service, PCA membership station, Team presentations and meet n’ greets, Technical partner presentations, Chance to drive the track on an exclusive Porsche parade lap (for the first 25 cars to arrive per day), Raffle draws for giveaways, and a Exclusive Porsche Corral parking pass, all this for $20 (per car). 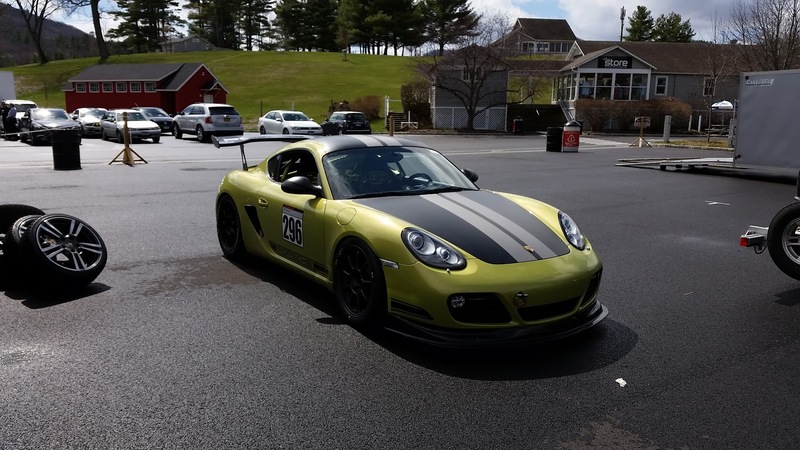 (https://tickets.limerock.com/eventperformances.asp?evt=102 ) Does NOT include track admission. 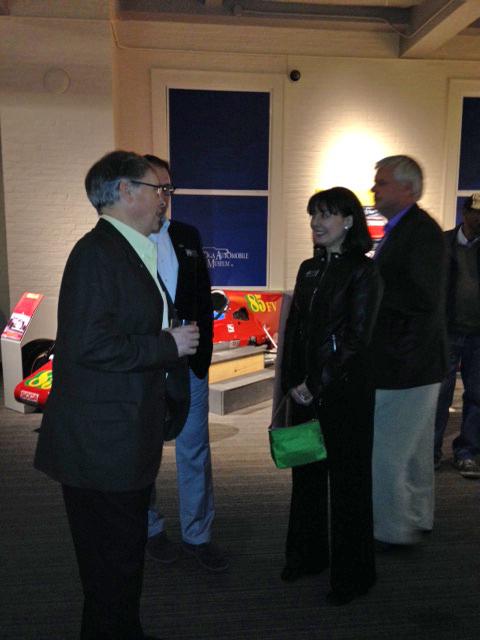 Please email me at Louis.dahoda@edwardjones.com if you are interested in having dinner with us after the race. I need an accurate headcount by July 20th. 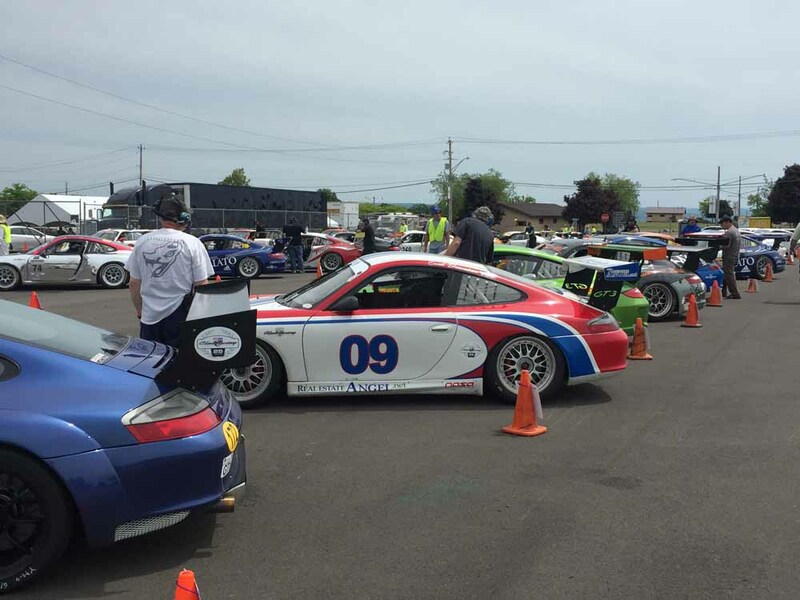 Also, go online to purchase advanced ticket and your corral ticket at https://tickets.limerock.com/eventperformances.asp?evt=102. 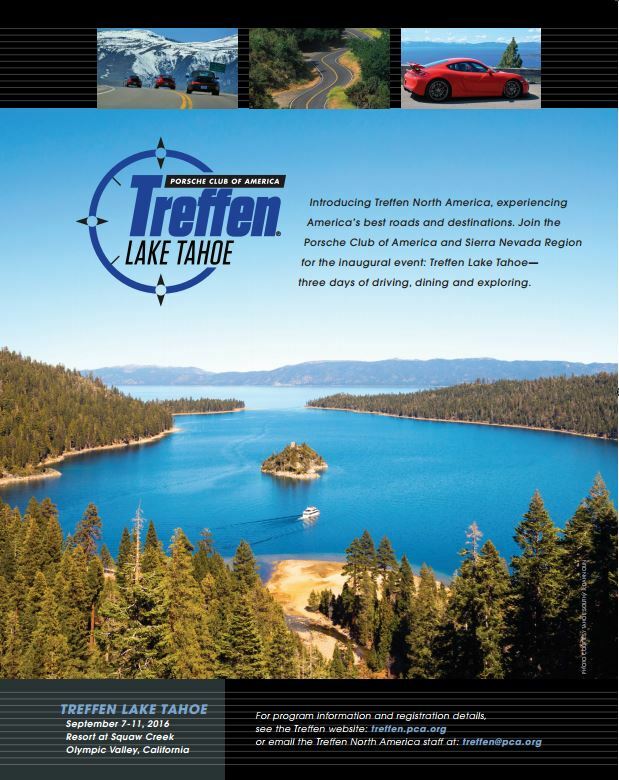 July Drive & Dine – Saturday July 30, 2016, 10:00A.M. – 5:30 P.M. Majestic Drive through Saratoga County to visit their local horse farms followed by a fine French meal at Chez Pierre Restaurant. 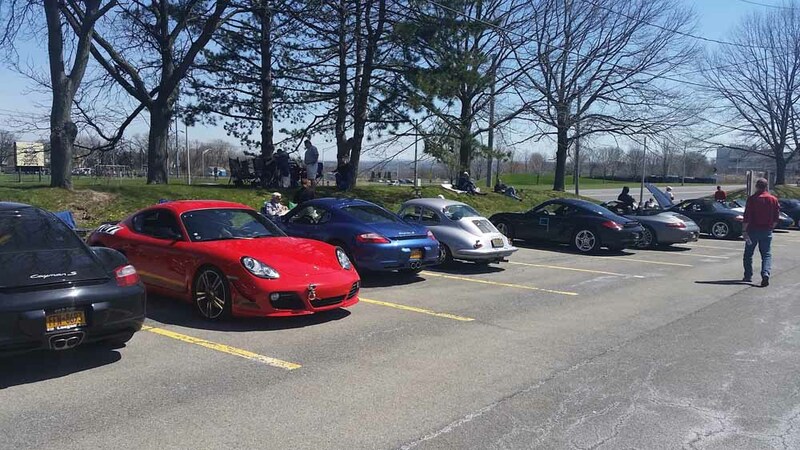 Starting at 10:00 AM with Cars & Coffee at New County Porsche (https://porscheofcliftonpark.com/) 205 NY-146, Halfmoon NY 12118. Leaving at 11:30 AM for a self guided Horse Farm Tour with in Saratoga County ( http://ccesaratoga.org/agriculture/cce-equine/horse-farm-tour ). 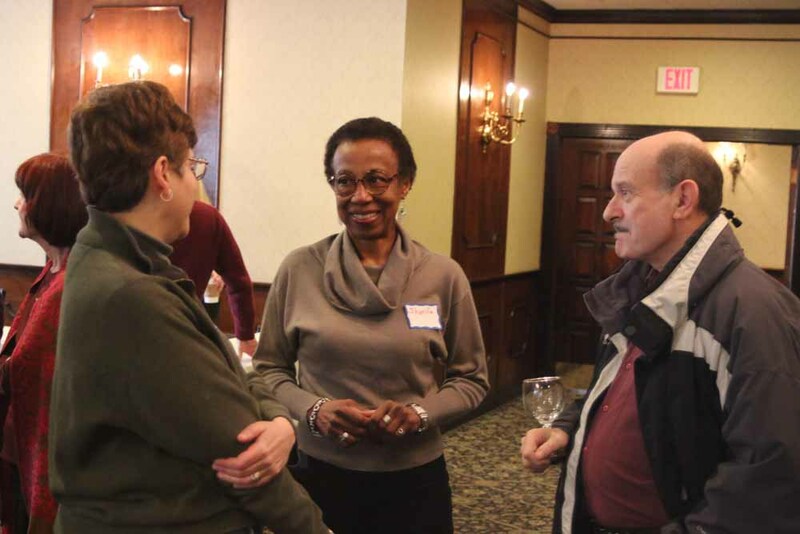 This event is sponsored by the Cornell Cooperative Extension, then we will finish the day with a French meal at Chez Pierre Restaurant (http://www.chezpierrerestaurant.com/dinner-menu/) 979 Saratoga Rd, Gansevoort, NY 12831. 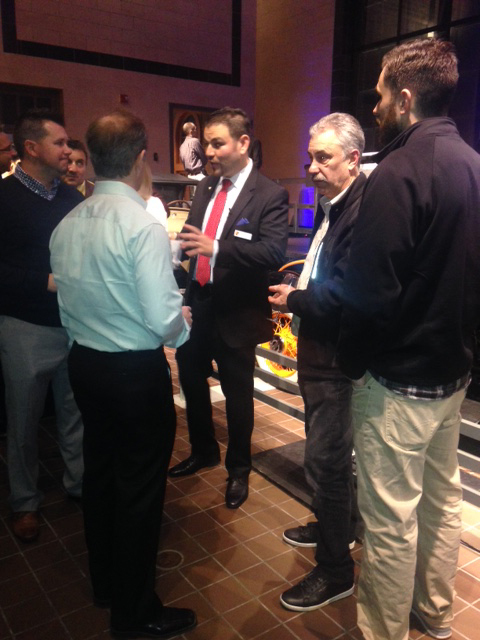 Please email me at Louis.dahoda@edwardjones.com if you are interested in having dinner with us after the tour. I need an accurate headcount by July 27th. Heartbreak for Toyota. 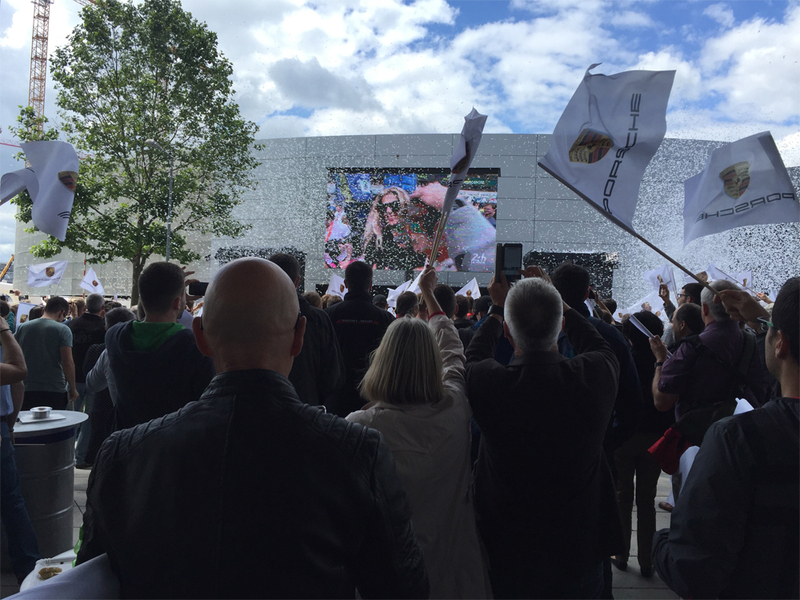 Elation for Porsche. 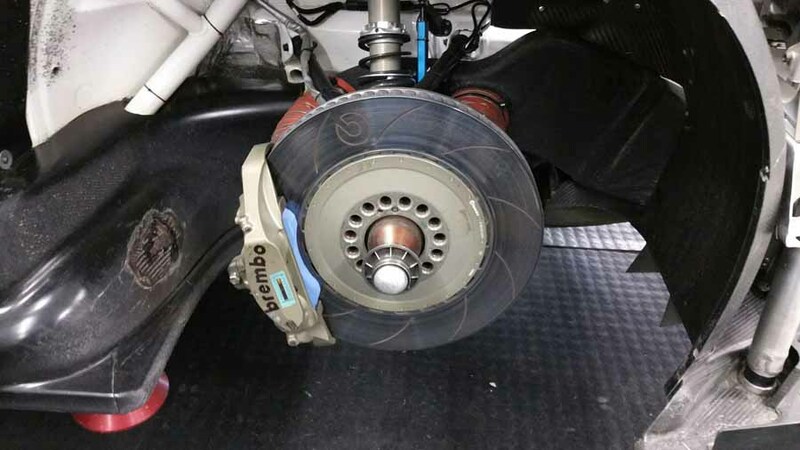 The 86 running of the 24 Hours of LeMans was decided with just three minutes left in the race when the leader, the Toyota #5 car, died on the track when a connector between the car’s turbocharger and intercooler failed. As the Toyota coasted to a stop, the Porsche #2 car, a 919 hybrid which had been in the thick of the action throughout the race, was able to erase the one minute gap the Toyota had built and win the race. 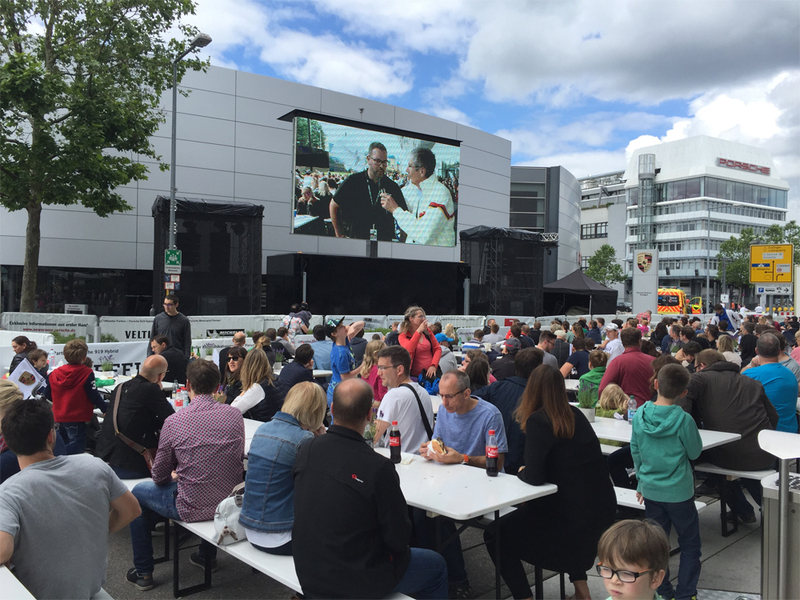 Great drama and where better to watch the dramatic conclusion that in Stuttgart, Germany. 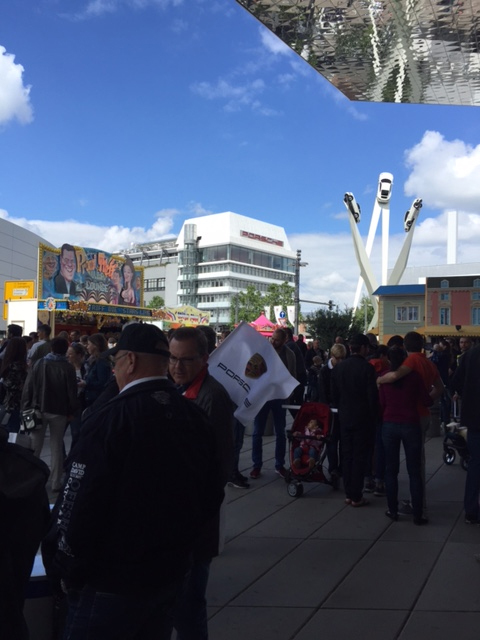 Thanks to Bob Bailey who emailed these shots of events at Stuttgart along with video of the last lap of the race and reactions of the Porsche and Toyota teams. 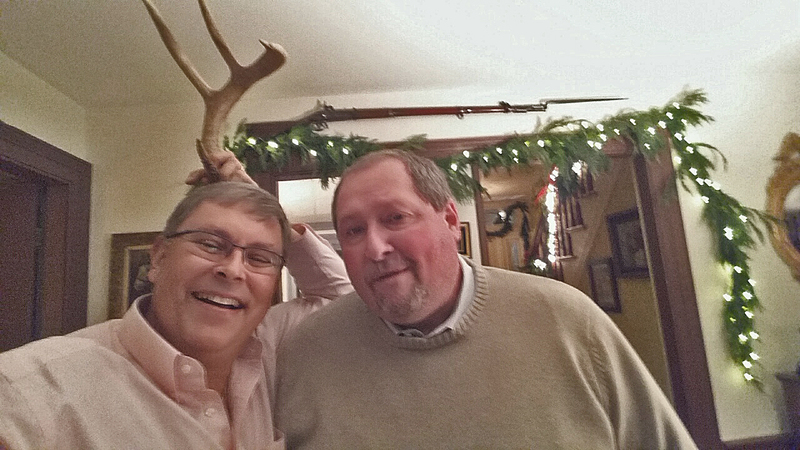 Just in… A couple of photos from HCP President Jim Morgan who is spending time at the Parade. 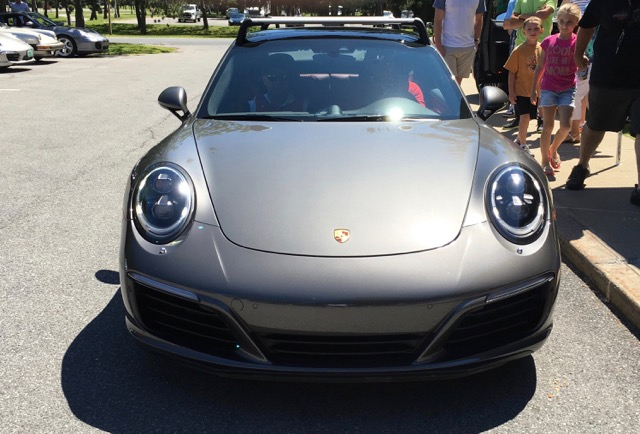 “It’s better in every way.” That’s the assessment of the new 911 turbo from Jeff Robillard, a man who knows his Porsches. 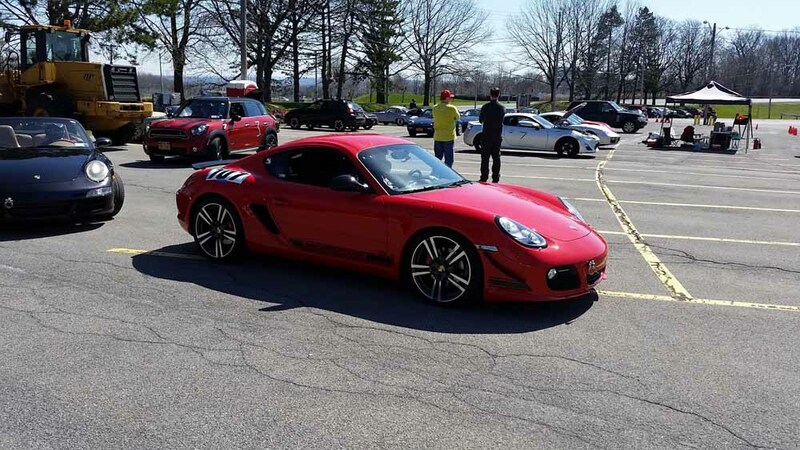 Jeff, who has been an instructor with Porsche’s U.S. Sports Driving Program since its inception, was in the Saratoga area with one of the new cars for a special four day Cars and Coffee event sponsored by Porsche of Clifton Park. 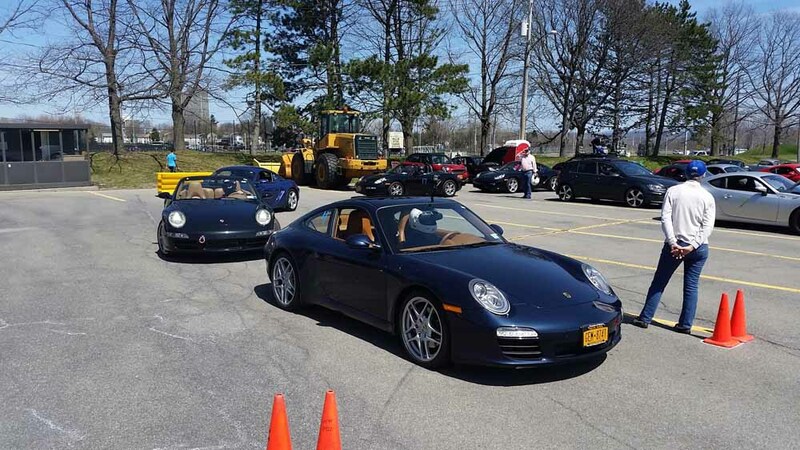 The event offered a chance for Club members test drive the new 911 and confirm Jeff’s opinion. 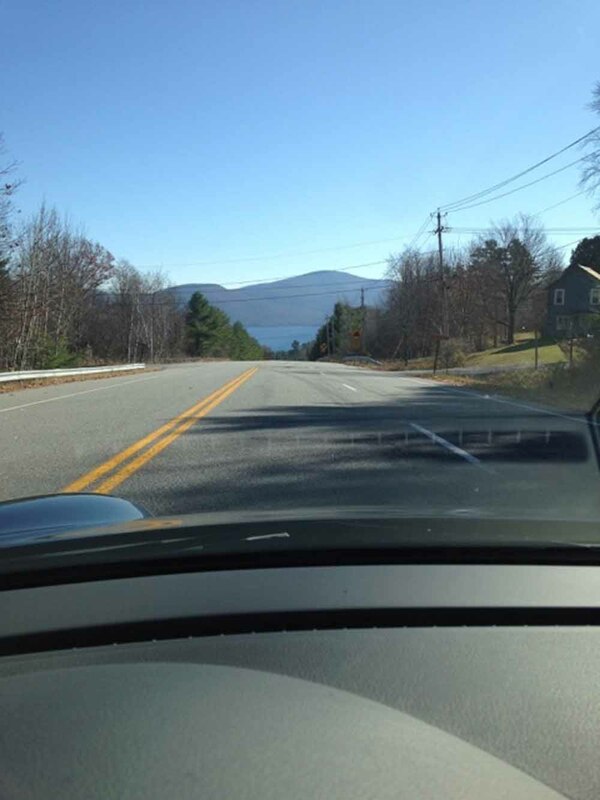 The roads around Lake George were the setting for the first day of drives on Thursday, 6/17. 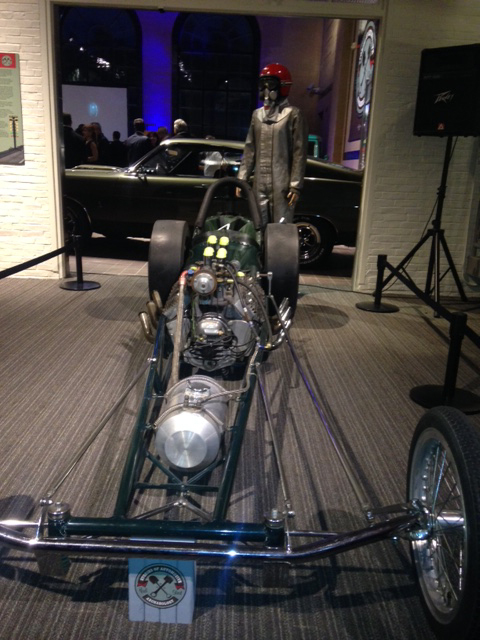 For the next three days the event moved to Saratoga, departing from the Auto Museum on Saturday. 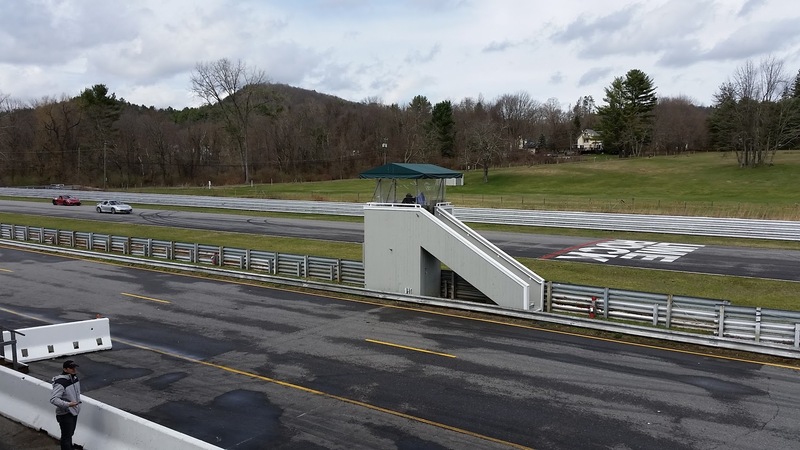 By the end of the weekend over fifty drivers had experienced the new car’s increased horsepower and torque and had been pressed back in the seat after hitting the car’s turbo boost button and stepping on the accelerator. 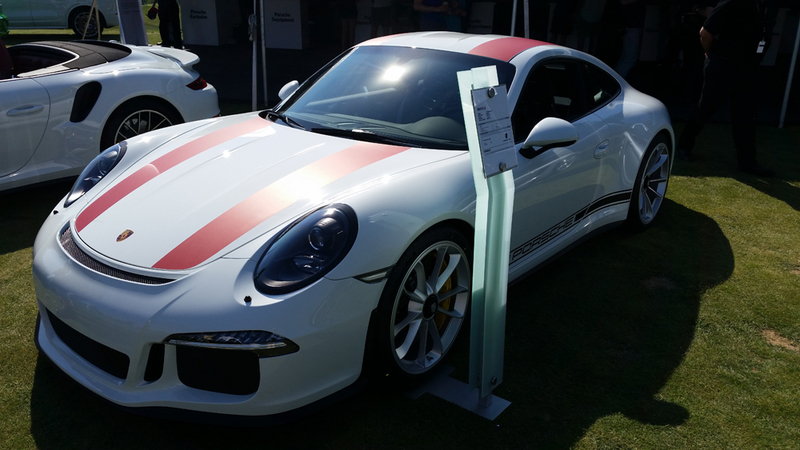 The option provides twenty seconds of extra boost that can propel the Turbo S model to 60 mph in 2.8 seconds. 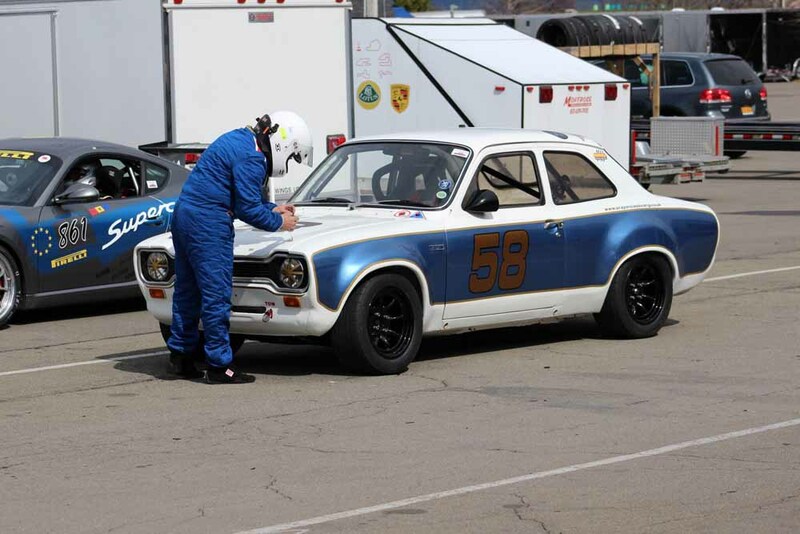 With boost, the base model Jeff brought hit sixty in a tick over four seconds. 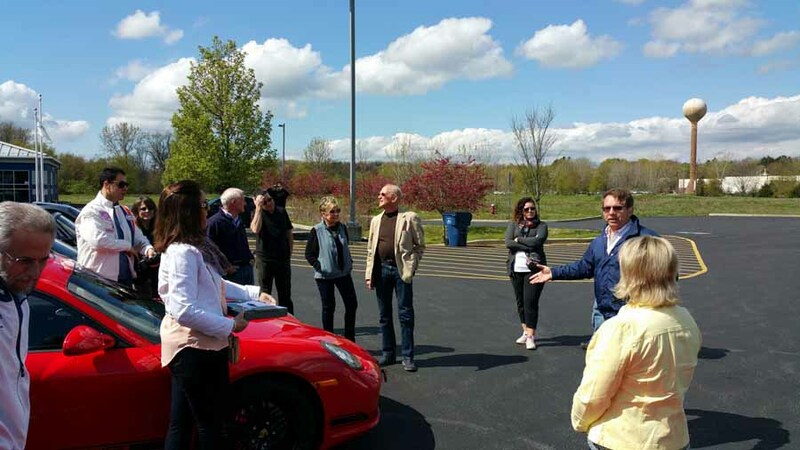 Even with the relatively straight roads and restricted speed limits of the test drive route out of Saratoga, it was possible to get an idea of the extraordinary acceleration, handling and braking of the car. 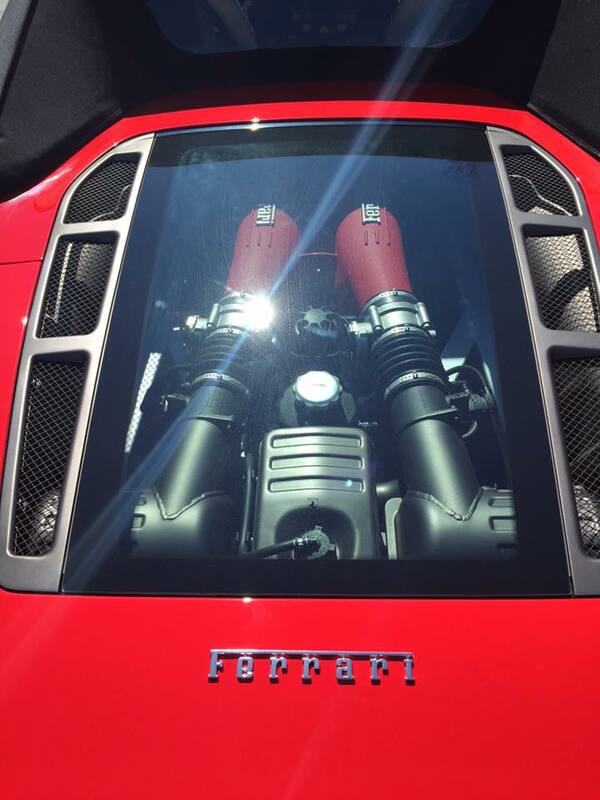 Those worried about the car losing the legendary exhaust note of the normally aspirated flat six have nothing to fear. The car, especially in Sports Plus mode, has quite a growl. Of course, such performance doesn’t come cheap. Adding virtually every performance option available tacked another $45,000 on to the vehicle’s base of $89,400. 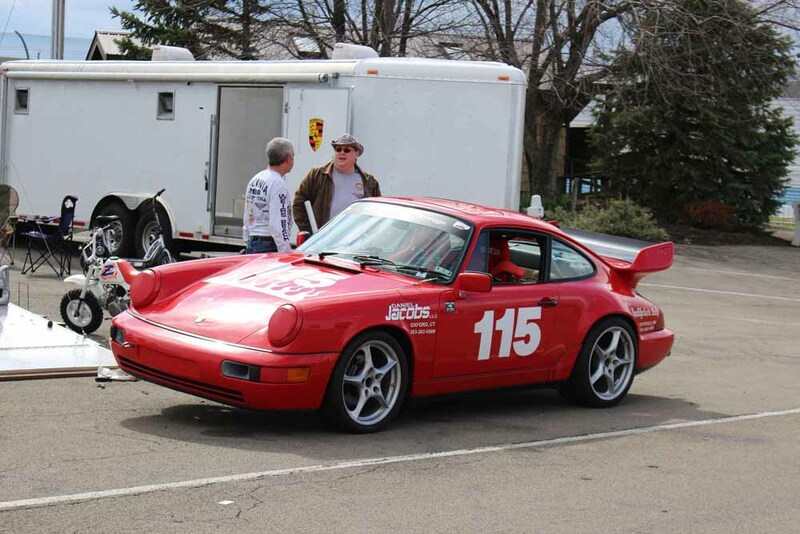 As great as the 911 turbo is, the most enjoyable part of the drive might have been the chance to talk with Jeff. 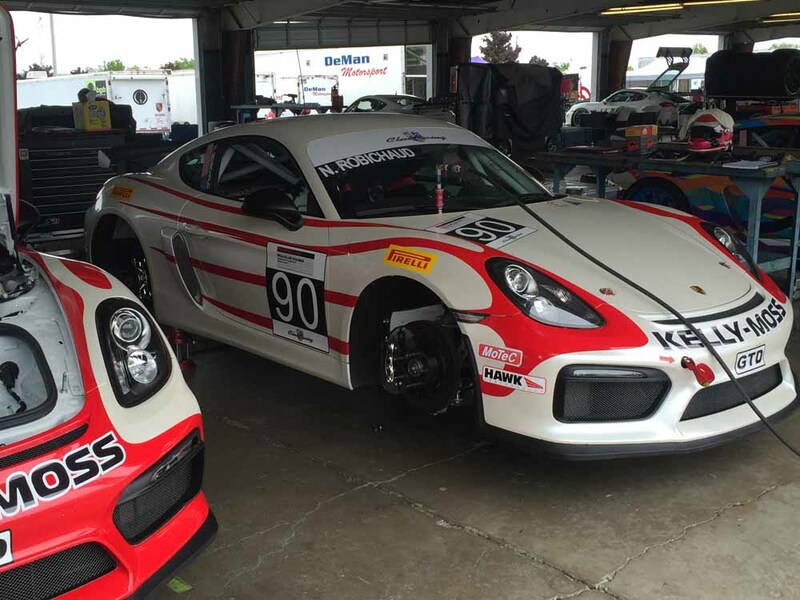 He started with Porsche’s school at the Road Atlanta Race Track in 2000. 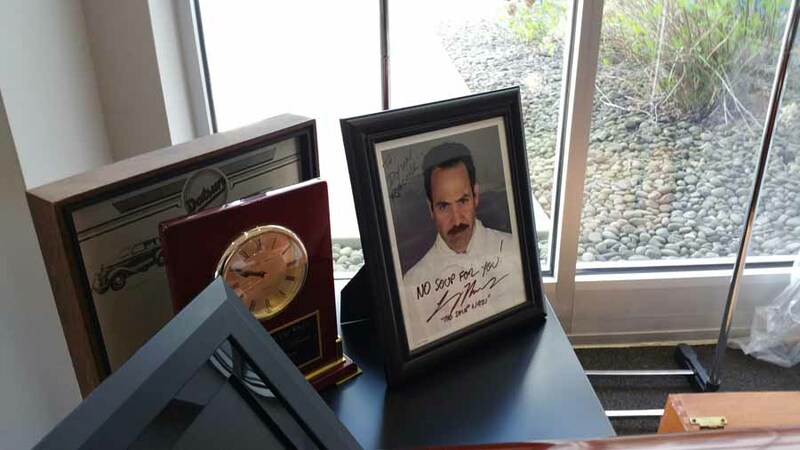 The school proved so successful that the 100 days available in Atlanta weren’t meeting the demand so, after three years the school moved to the Barber Motor Sports Park in Birmingham, Alabama. Adorned by George Barber’s nursery, the track is often dubbed the Augusta of race tracks in a nod to the beautiful landscaping of the Augusta National Golf Course in Georgia. Jeff teaches at Birmingham forty to fifty days a year. 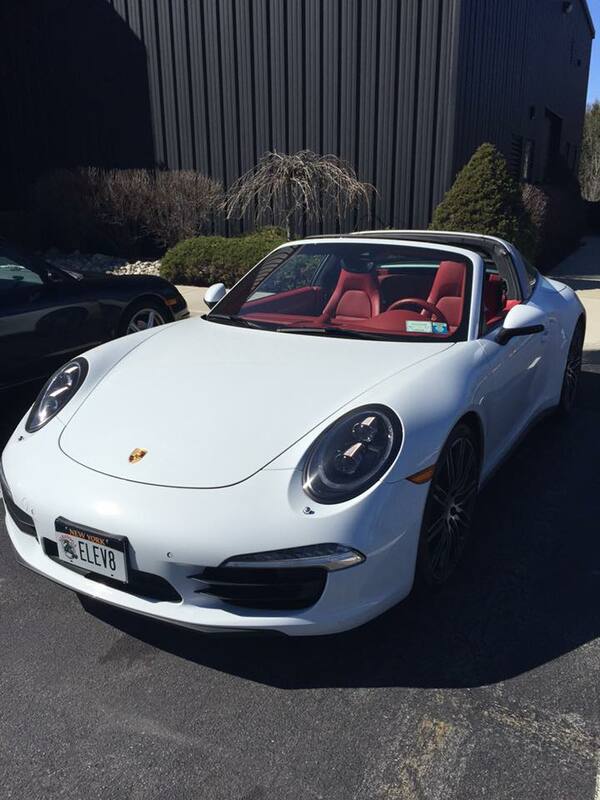 He’s on the road bringing Porsches to the public another fifty to sixty days. 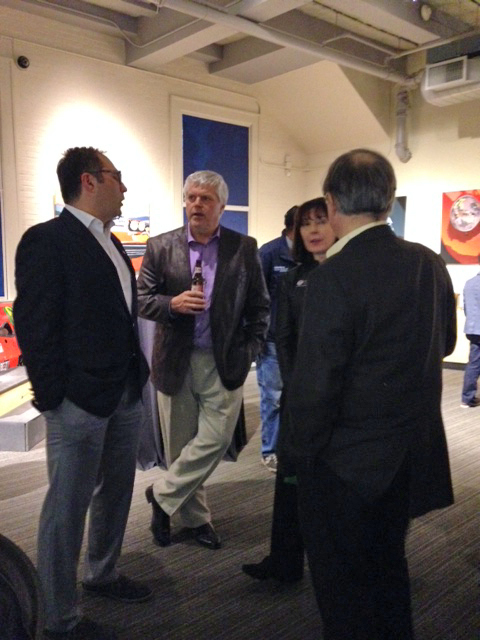 Jeff, too, enjoys test drive events because of the conversation. 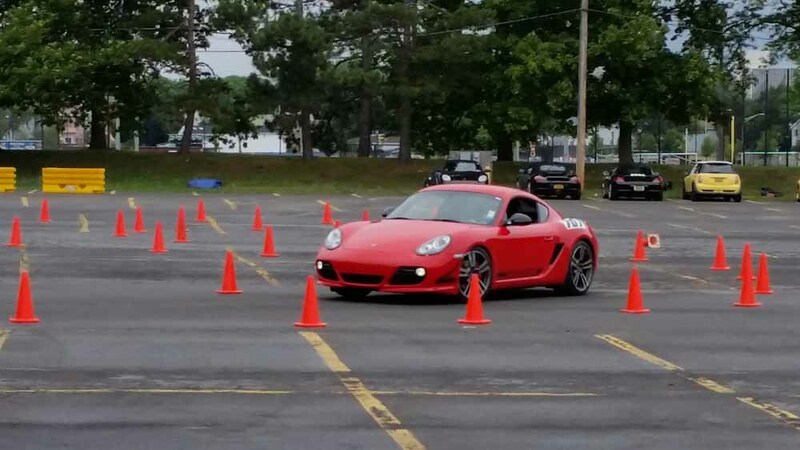 While topics range widely, the most frequent question Jeff gets from drivers is “how do I drive an automatic?” For those weaned on six speed gear boxes, it’s a changing world: the GT3 RS is PDK only. 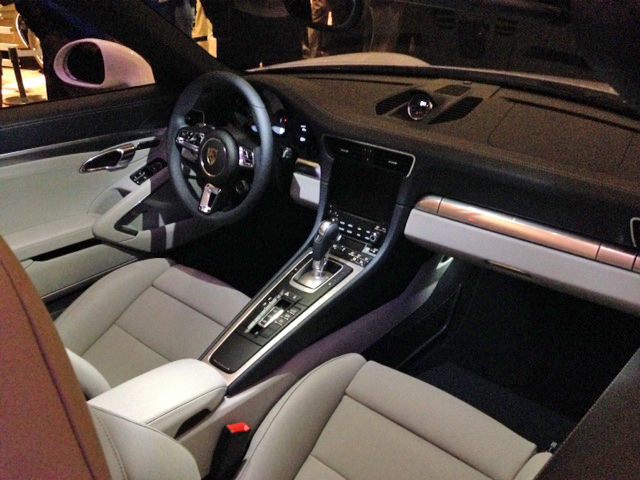 Paddle shifting was the only manual option in the test drive car. Jeff says as enjoyable as running through gears manually can be, manual shift cars give up seconds to their doppelkupplung counterparts on the track. 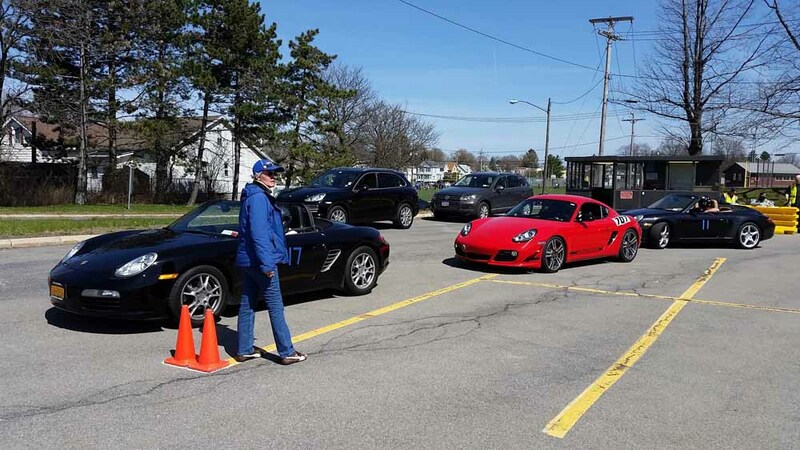 Another question Jeff often hears from drivers as they contemplate the speed and acceleration the 911 turbo- “Have you ever had anyone get ticketed during a test drive?” Says Jeff, that does happen- an exciting test drive followed by an expensive ticket in the mail. A special thanks to Allen Schwartz for his reporting and photography, without which, this article would not have been possible. 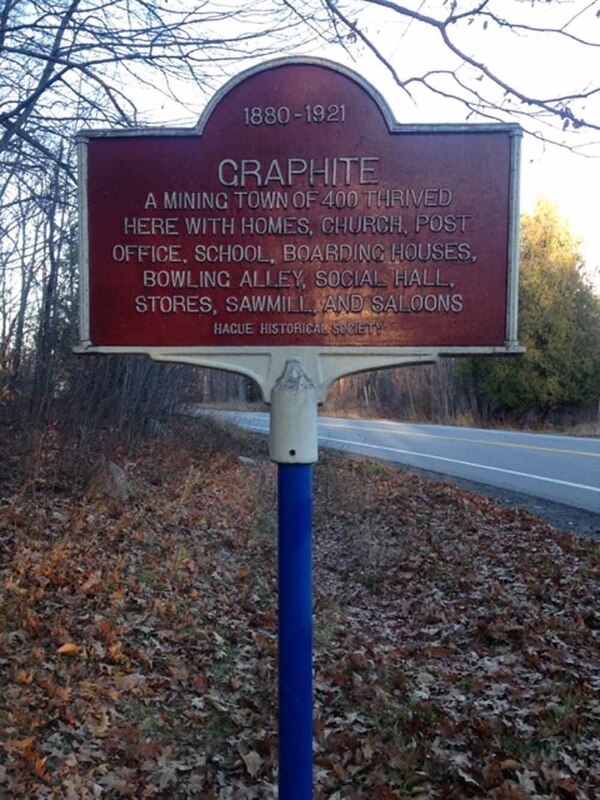 Every now and then, Open Roads will reach into the past for a bit of club history. For those of you who are still shivering from this past weekend’s picnic, here’s what the day looked like seven years ago. 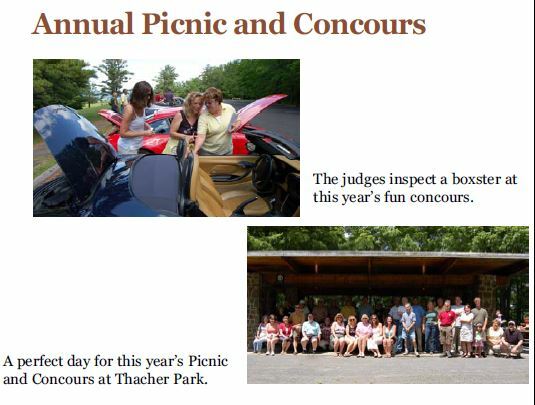 Photos taken from the Summer 2009 edition of the Air Cooled Advertiser, the Club’s pdf newsletter. 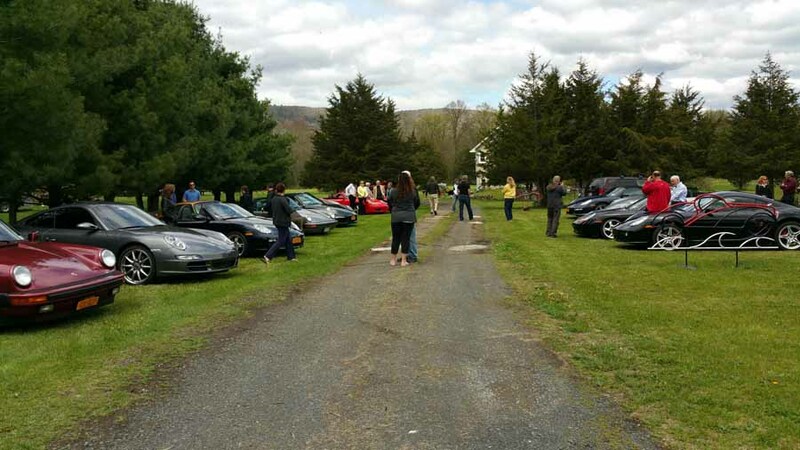 What would Natty Bumppo have thought: twelve Porsches winding their way through Leatherstocking Country towards Cooperstown, NY, the destination for May’s HCP-PCA Drive and Dine. 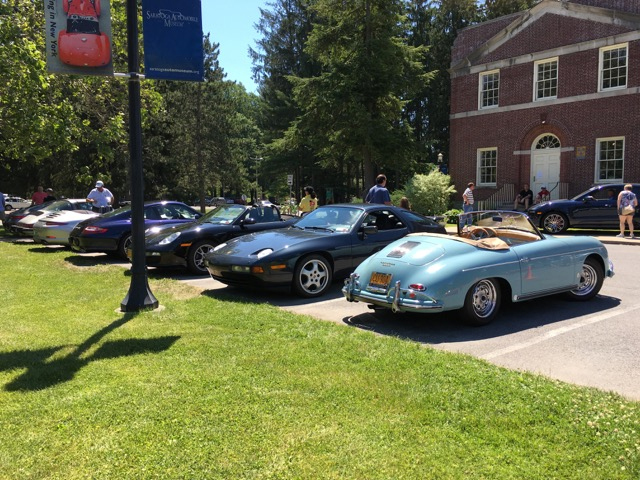 Cooperstown, which began with William Cooper’s purchase of 10,000 acres of land along Otsego Lake in 1785, is today a beautiful village of museums, stately homes, attractive shops and excellent restaurants- the perfect destination for an HCP outing. 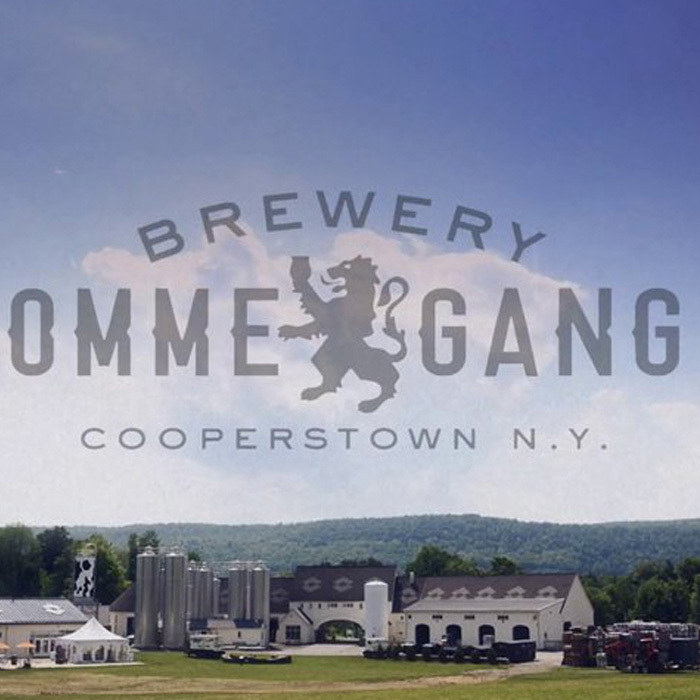 Some club members walked Cooperstown’s streets and visited the Baseball Hall of Fame while others took a short drive to the Ommegang Brewery. Set on 136 acres and built to model a Belgian farmhouse, the brewery currently produces over forty different styles of Belgian Ale. While the brewery, now owned by Belgian brewer Duvel, produces craft quality beer- with a production of over four million bottles a year, it is, technically, no longer a craft brewer. Those who made the trip to Ommegang took a look at the brewery’s ale-making processes and sampled five of its most popular brews- as well stocking up on a number of them in the brewery’s gift shop. 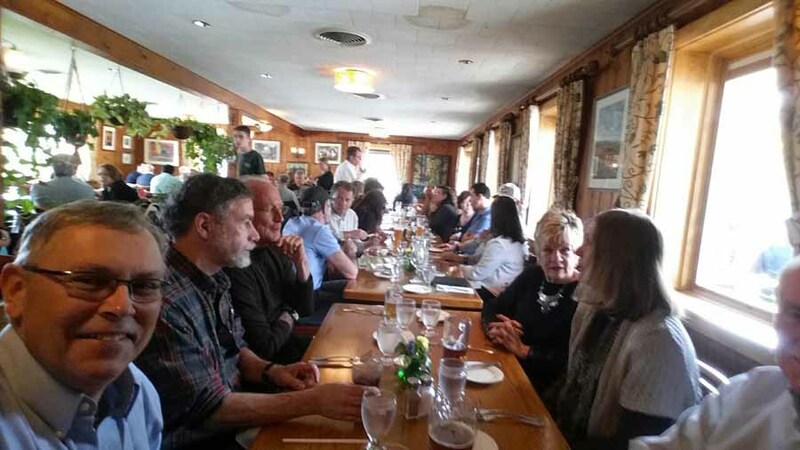 One-o’clock brought everyone back together for lunch at the Lake Front Restaurant and a chance to embarrass Andy Dorman by celebrating his birthday with a singing of Happy Birthday by the HCP Chorus. 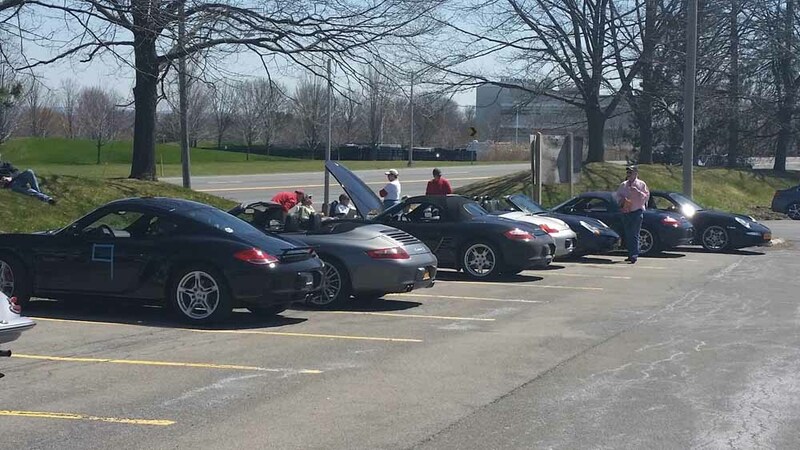 The day, which began with ominous skies and showers on the drive to Cooperstown, ended with sunny skies and temperatures in the seventies- good fortune for Boxster owners who were able to drive home with tops down. 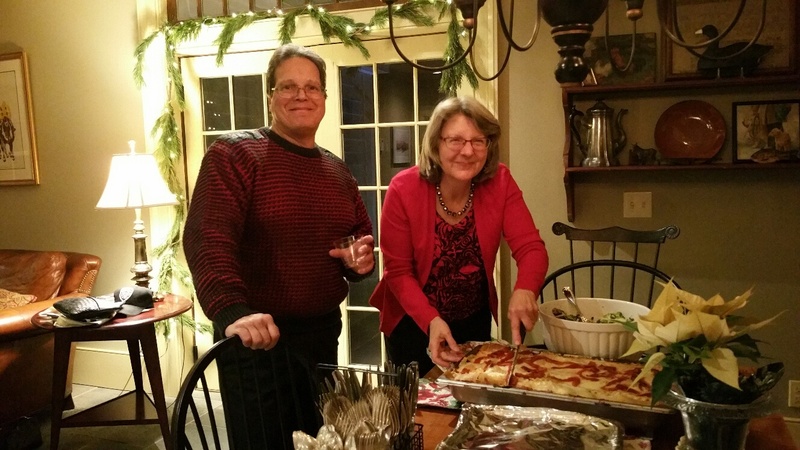 Thanks to Bryan and Joyce Hollenbaugh for arranging and leading a great outing. 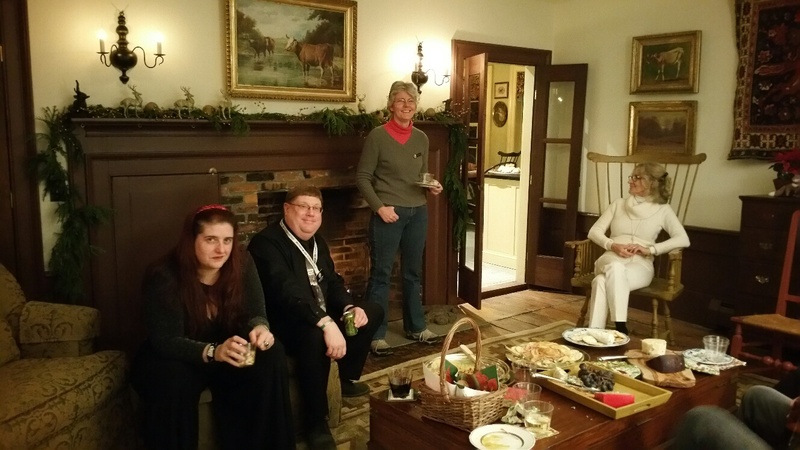 Watch for details on HCP’s next Drive and Dine- a tour of Saratoga County horse farms at the end of July. 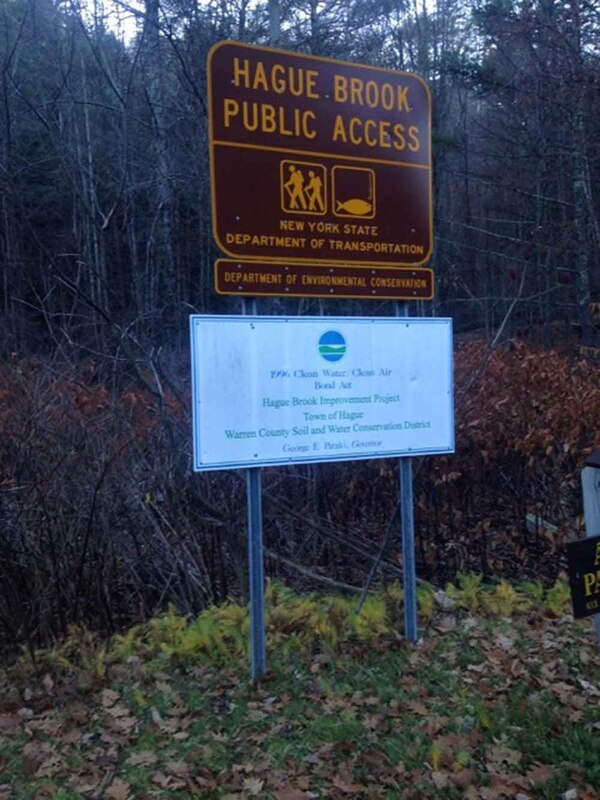 Spend the day in scenic Cooperstown, NY. 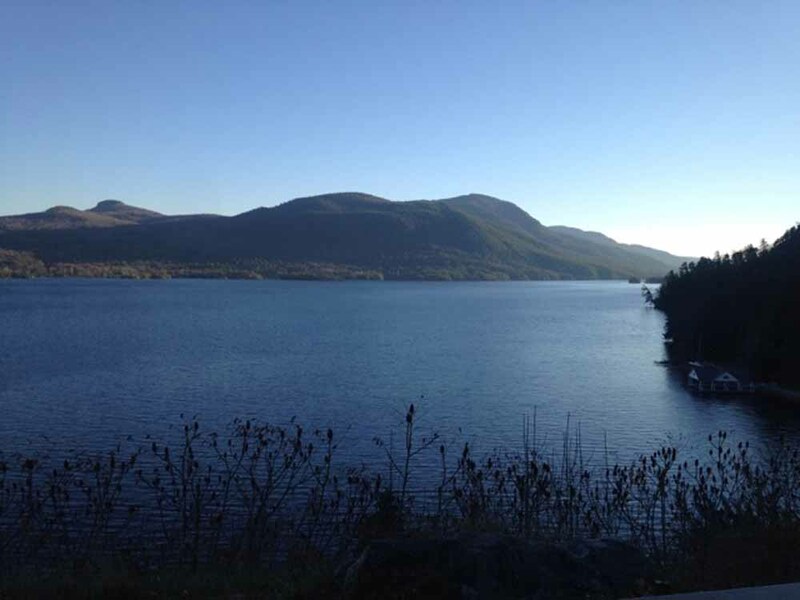 Whether you’re in it for the scenic drive (great back roads along lakes and through Amish country); a visit to the Ommegang Brewery, window shopping along Main Street, a walk through the world-famous National Baseball Hall of Fame, or simply enjoying lunch and libations overlooking Lake Otsego; there’s a little something for everyone to enjoy. 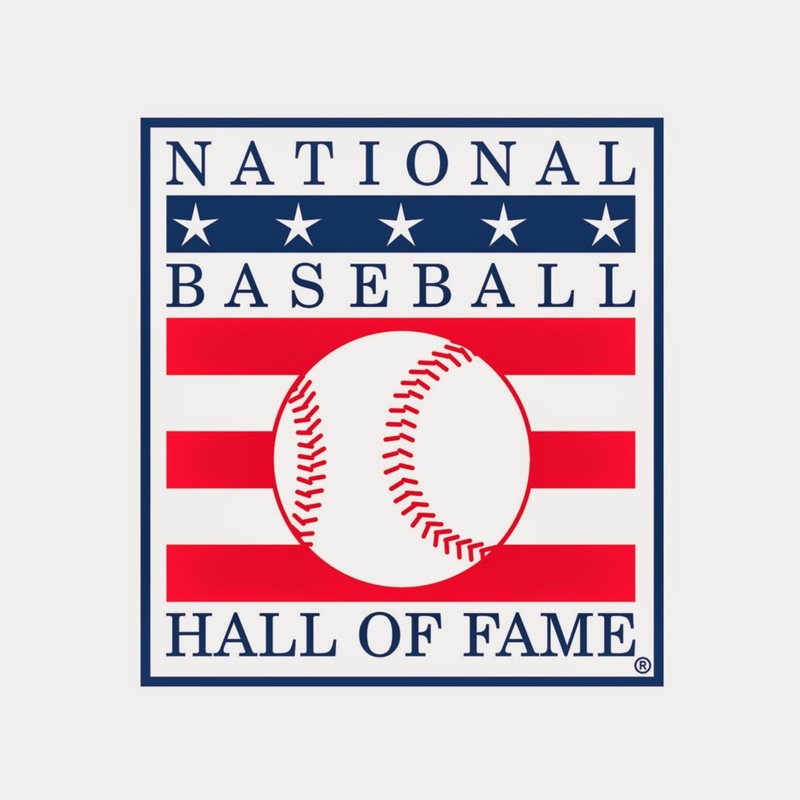 The trip includes a pair of complimentary admission passes to the National Baseball Hall of Fame that can be used at any time. 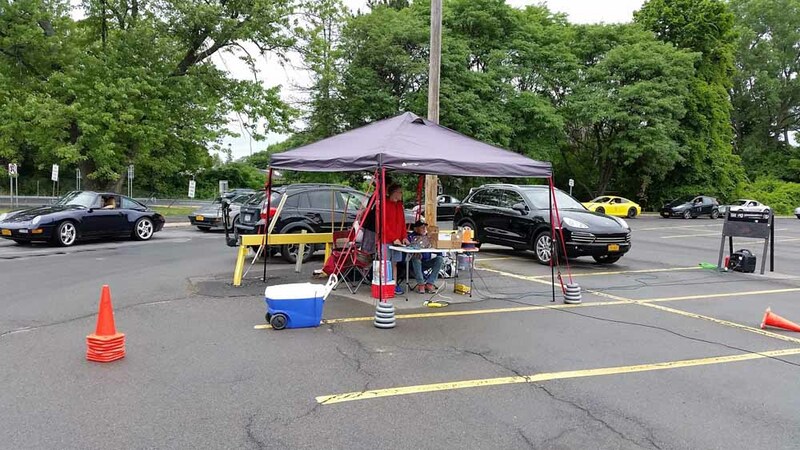 The only thing firm is that we’ll meet in the parking lot of Schenectady Community College at 8:30 am, so we can get you signed in, briefed, and be on the road by 9 am. 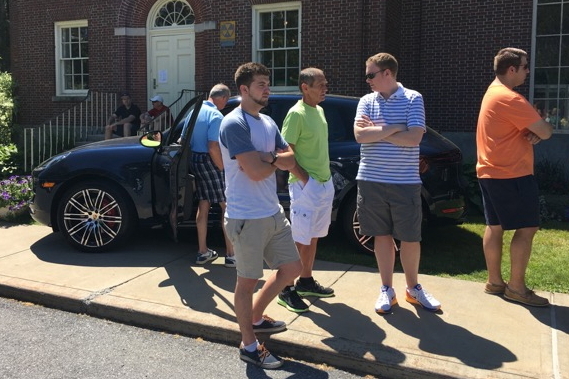 After about a 90 minute drive, we’ll arrive in Cooperstown where participants can determine what they want to do until we all meet back up for lunch at a location to be determined. It was rainy. It was sunny. It was a lotta fun. 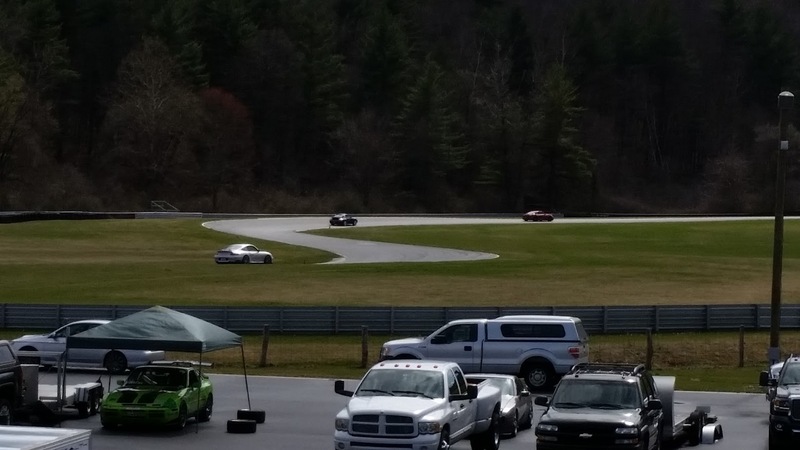 That’s the way chief track instructor Andy Dorman described HCP’s first track event of the season, held at Lime Rock Park on April 1st and 2nd. 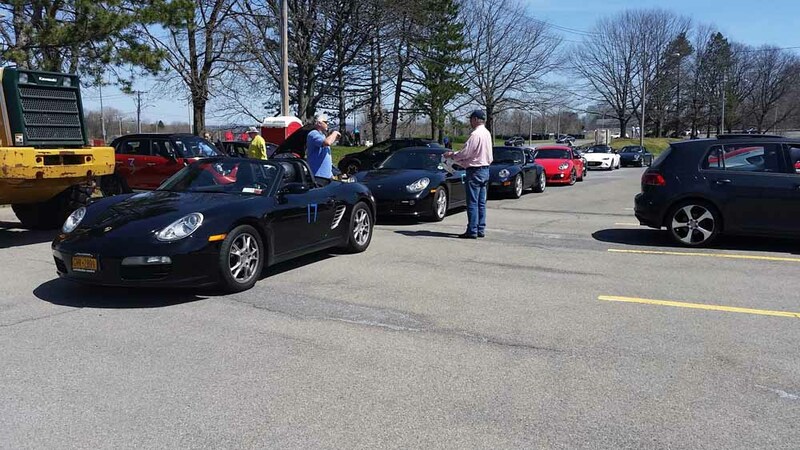 Twenty-six experienced drivers, those with more than hours of solo experience, took to the track on a sunny Friday. 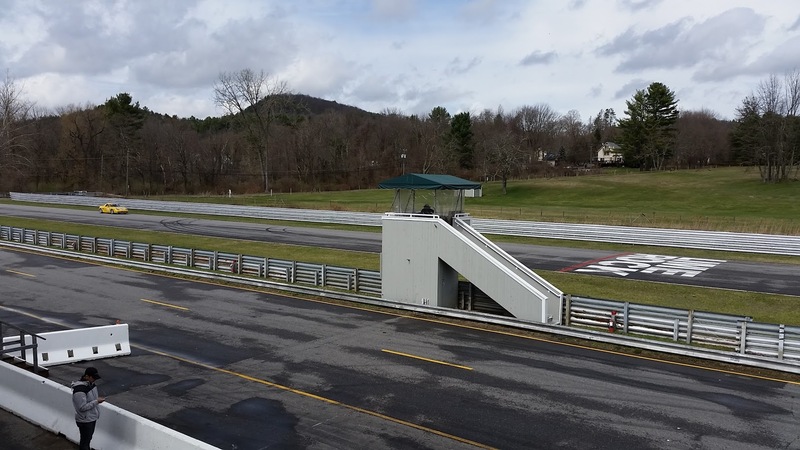 Saturday’s session, an opportunity for drivers with less track experience, was a good day for learning- intermittent periods of sun and rain produced changing track conditions and changing demands on the driver. 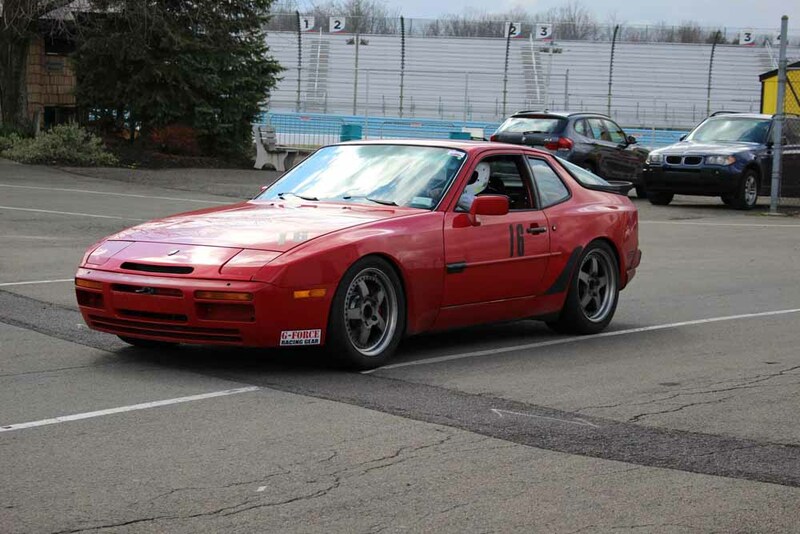 Twenty-eight drove the circuit on Saturday. 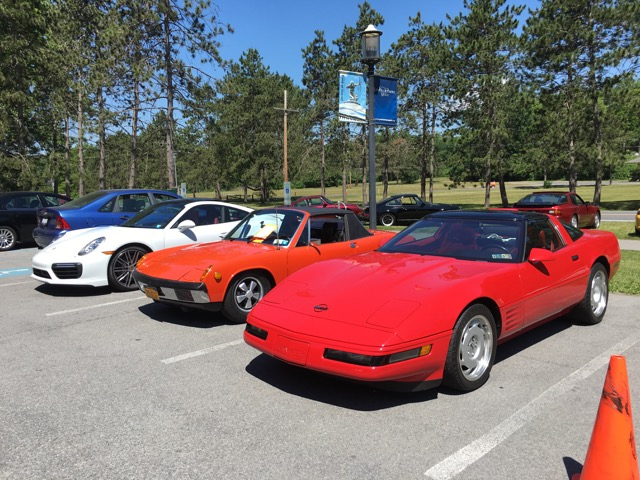 Registration for the 2016 Zone 1 Concours & Rally on May 13-15 is now open. Location: Old Westbury Gardens, Holiday Inn Westbury. Register Here . Sign up while early bird rates are still in effect. Full details, classes & rules can be found on Zone 1 website. There are only a few rooms left at the host hotel at the discounted rate and they will close out soon. 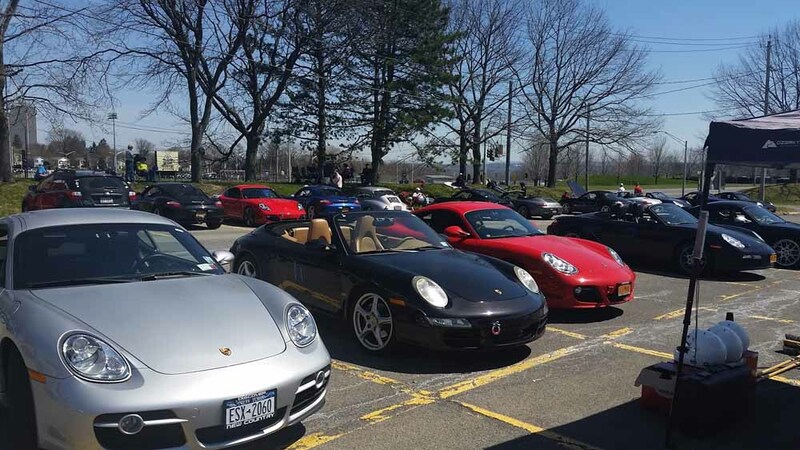 If you are planning on staying for the weekend book now by calling 516-997-5000 and reference the Porsche Club for special rates. Posted in Tech Talk	| Comments Off on A Hacker’s Delight? 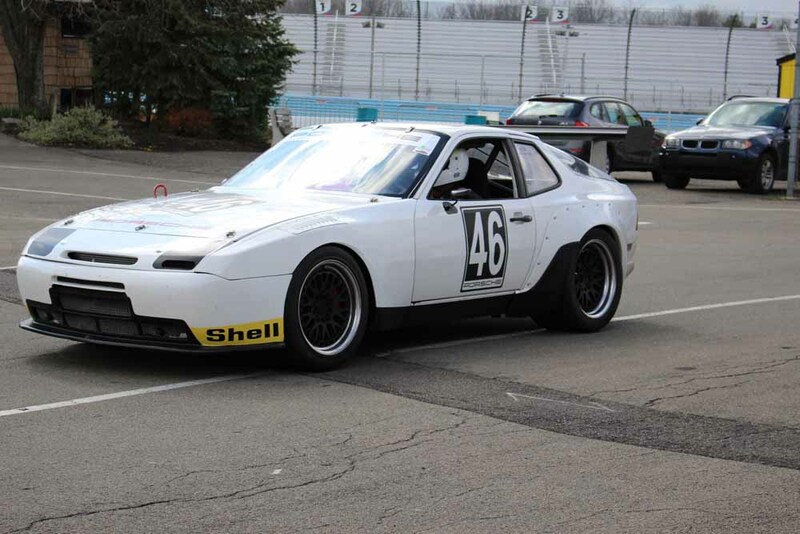 For all track enthusiasts in our club, here’s a link to a flyer describing describing the 2016 version of the Zone One 48 Hours of Watkins Glen. 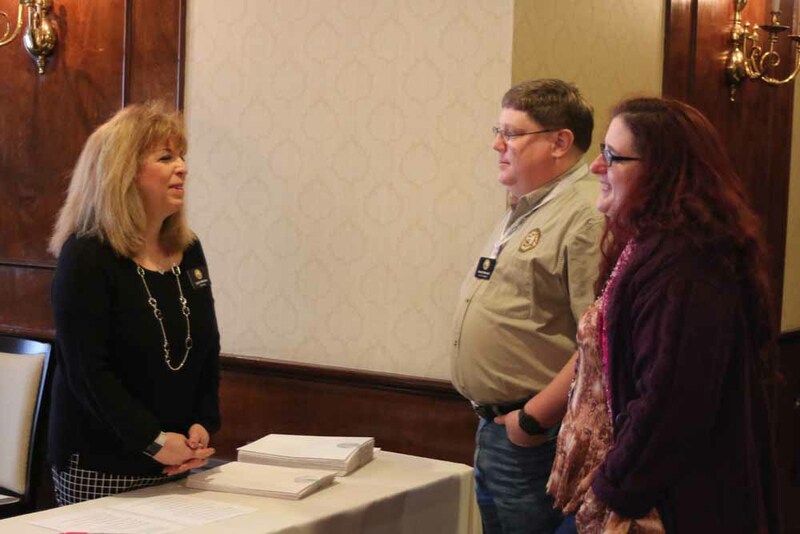 This event was first held in 1975 and has been run each year since. 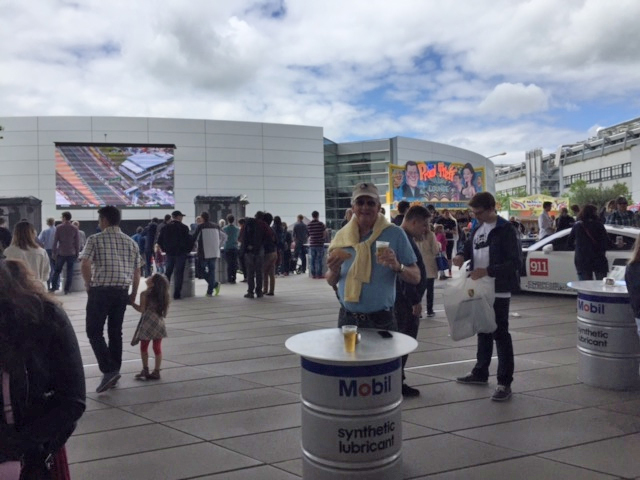 The event will be held on May 20-22, 2016 . The National Instructor Training Program will conducted on Friday May 20, 2016. Plenty of fun to be had at this historic, newly paved, facility. 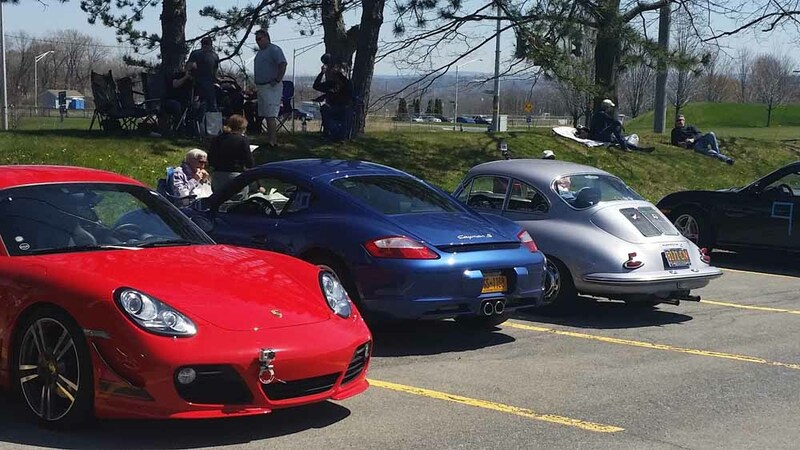 Sunny skies and temperatures well above average produced March Madness of a different kind as Porsche of Clifton Park hosted its first Cars and Coffee event of the season on Saturday, 3/11. 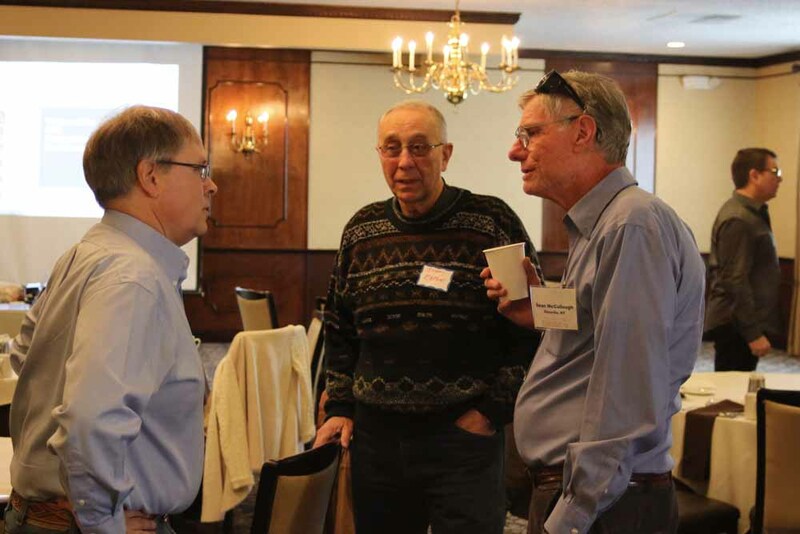 The event, taking place a month earlier than usual thanks to our forgiving winter, drew over fifty people who met friends, renewed acquaintances, sampled refreshments and talked cars. 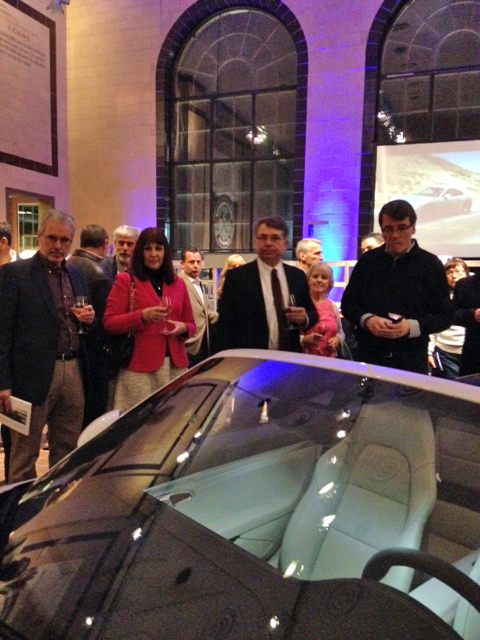 The vehicles on display certainly encouraged conversation. 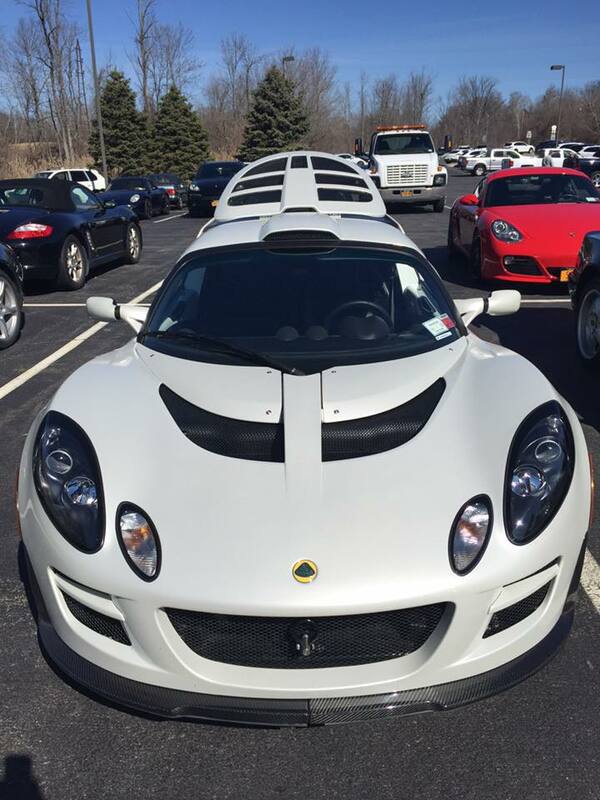 In addition to the assortment of new and used Porsches offered by the dealership, drivers arrived in Ferraris, Lotuses, BMW’s and some beautiful Porsches of their own. 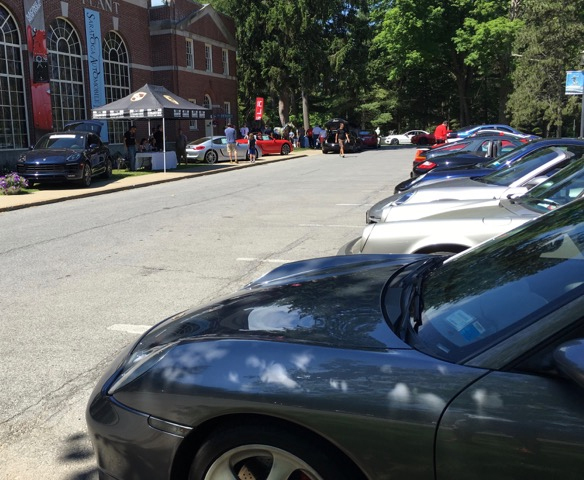 Porsche of Clifton Park hosts a Cars and Coffee event every month through the fall. 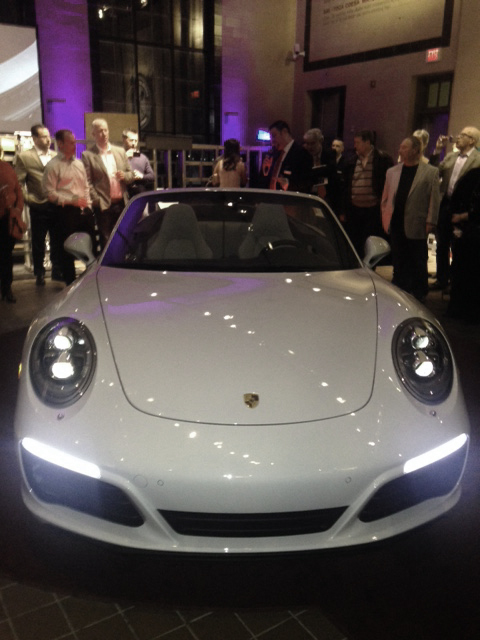 A thanks to the dealership for Saturday’s affair- a great way to kick off the 2016 driving season. 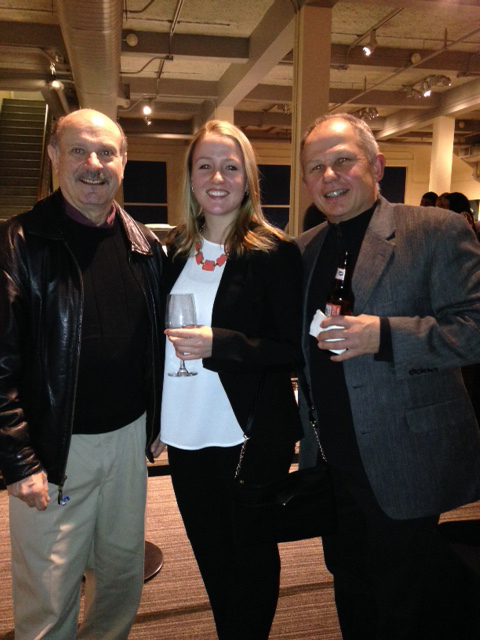 And thanks to Office Manager Melissa Ly for the photos that appear in the slide show. Some of you are probably aware that Bugatti is beginning production of its next supercar, the 1500 HP Chiron. In a real hit to the car’s performance, top speed will be limited to 260 mph- for road use. Really!?!. What roads will these guys be on? 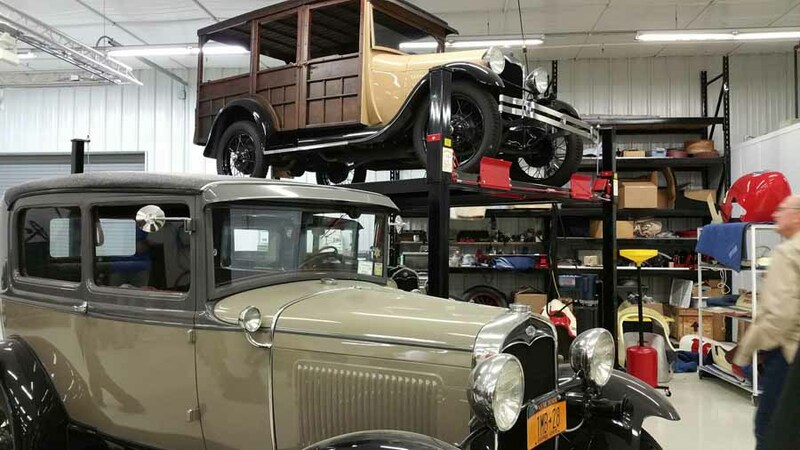 Anyway, private presentations of the car have been offered to “select customers” and the manufacturer claims advance sales of over 150,000 cars. Five hundred will be made in the first production run. So some are still available- if you’ve got $2.6 million lying around. Probably won’t be one in our driveway. 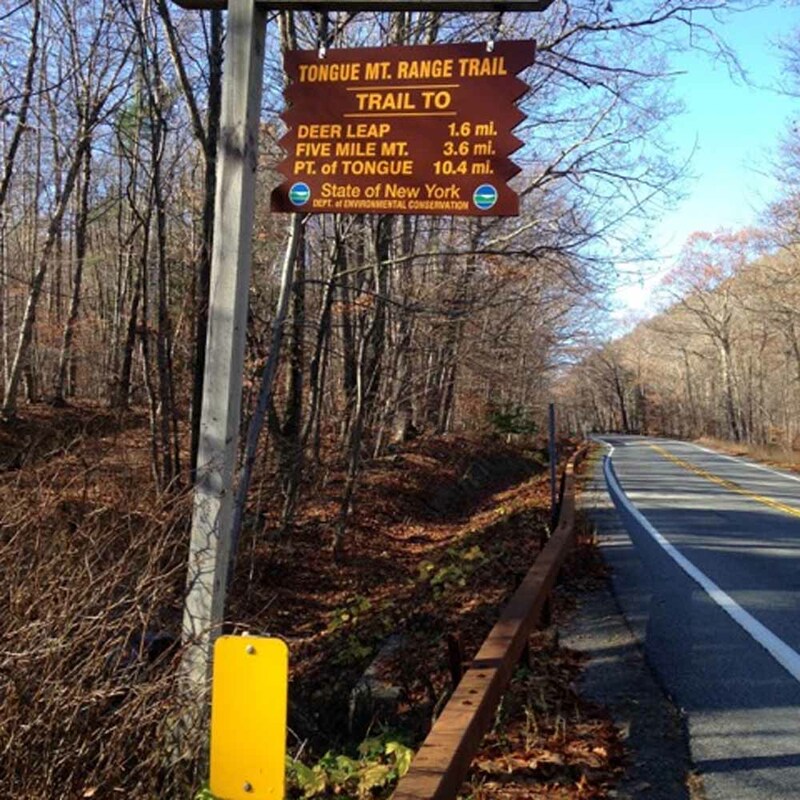 Posted in In the News	| Comments Off on What Roads? 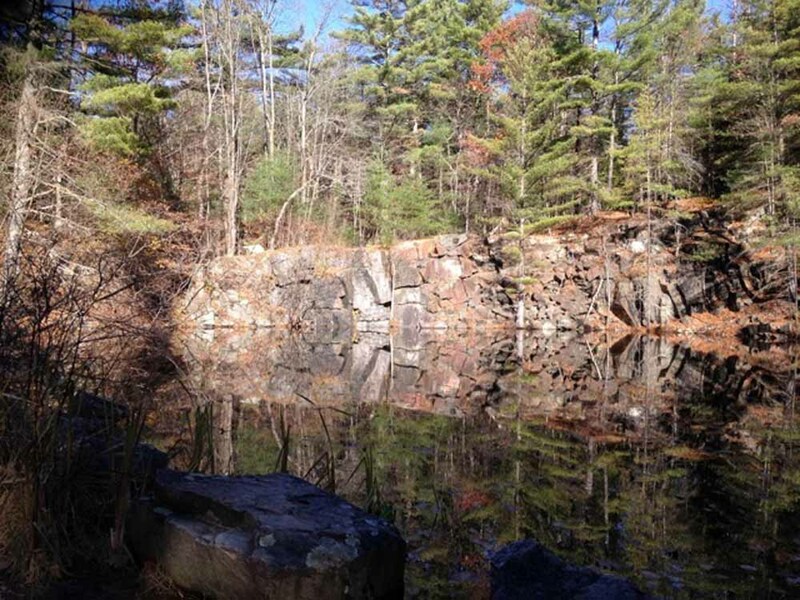 Activities chair, Louis Dahoda, has released this year’s Club activities calendar. You can find events using the calendar feature of our blog. Or, if you rather see all the events on one printable page, here they are in PDF format. Just click the link: 2016 activities calendar . 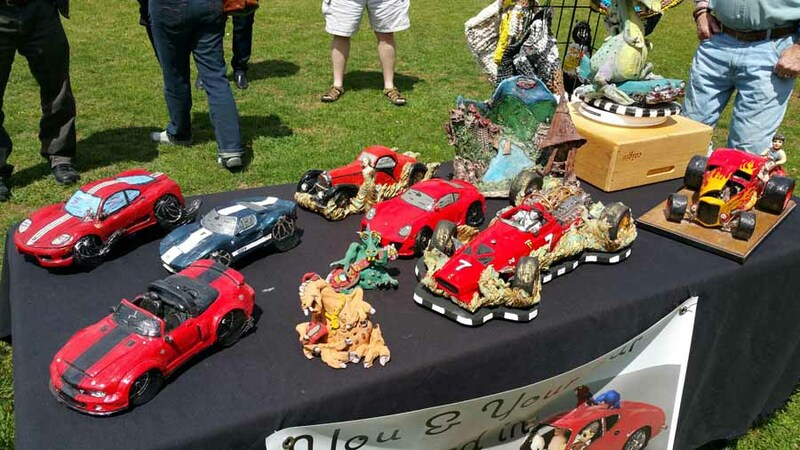 The PDF calendar includes Louis’ Drive and Dines as well as autocross, track, Zone 1 and National events in our neighborhood. 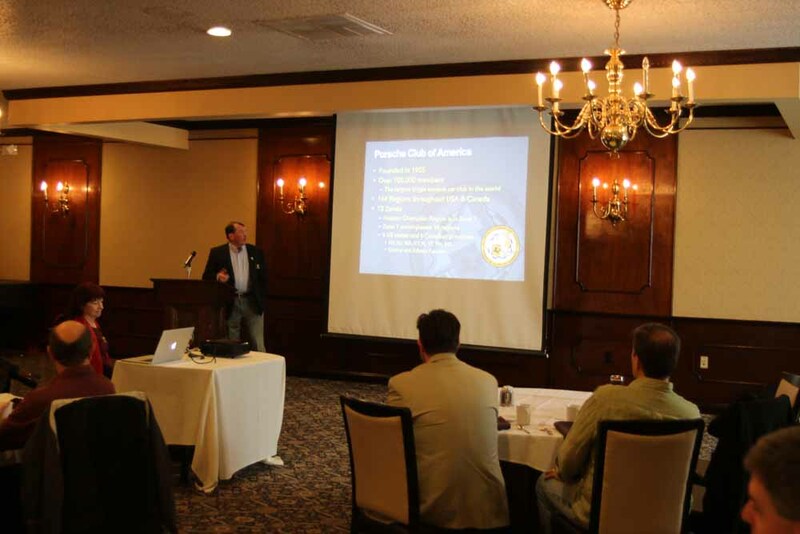 Louis’ schedule of Drive and Dine events should appeal to a wide range of club members. Hope to see you at some of them- they’re a great way to meet other club members. Activities will appear on the blog calendar as specific details about the events become available. 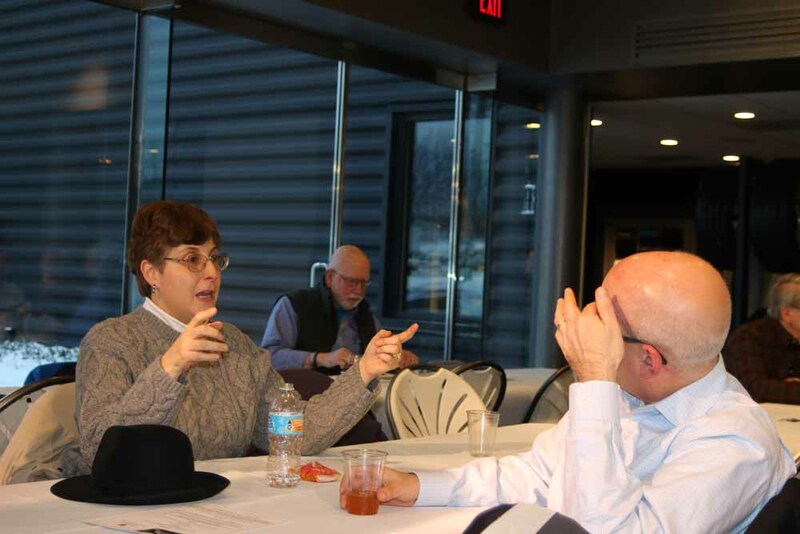 January Drive & Dine – Sunday January 31, 2016, 10:30 A.M. – 2 P.M. 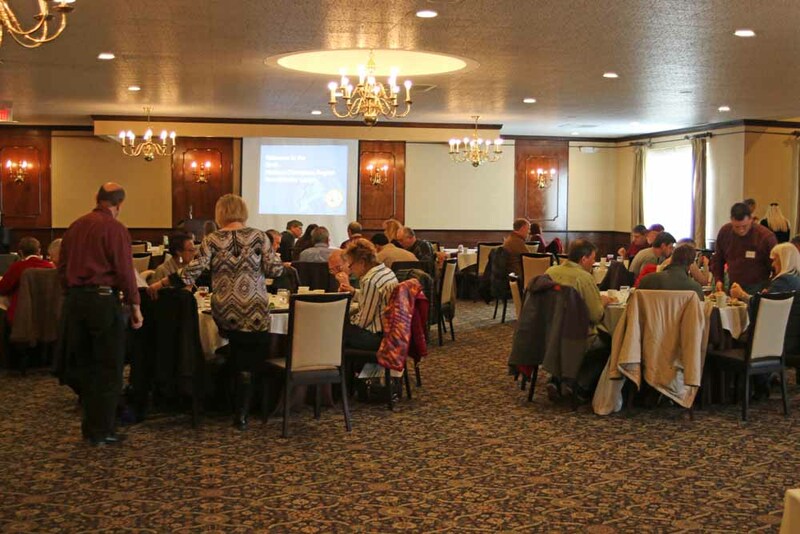 This event will be held at Prime @ Saratoga National ( http://www.golfsaratoga.com/dine/index.html ) We have secured the luxurious, heated back patio overlooking the golf course for our private event. For those who want to socialize in comfort, the patio will have plush couches and have private access to the outdoor fire pit. 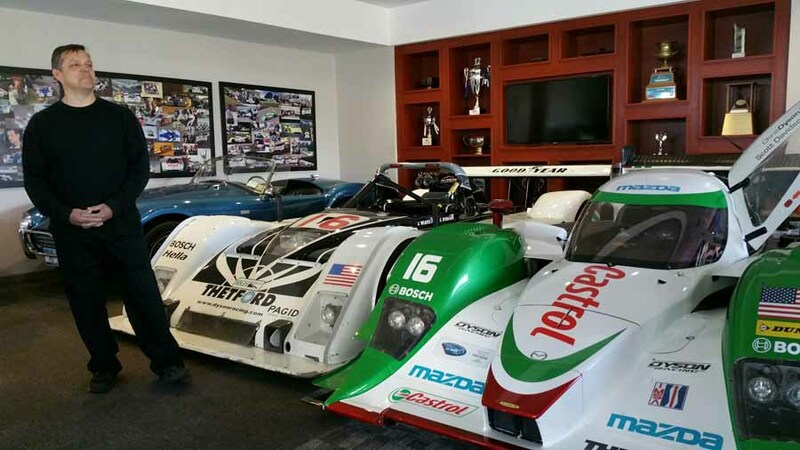 For those who will be entranced by the race, there will be a huge flat-screen TV over the bar for the Finish of the Rolex 24 at Daytona, North America’s premier sports car event. 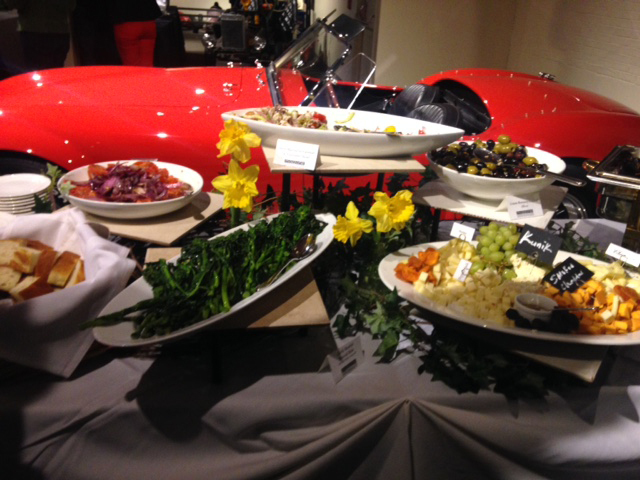 This does not even begin to describe the amazing Sunday brunch (click on link to see brunch menu) and other SURPRISES. In preparation for Prime National to be able to give us the utmost service, I will need to give them a headcount. 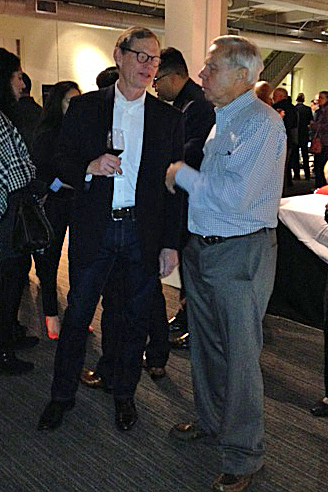 So, it is very important that you RSVP to fordgt66@hotmail.com no later than January 22, 2016. 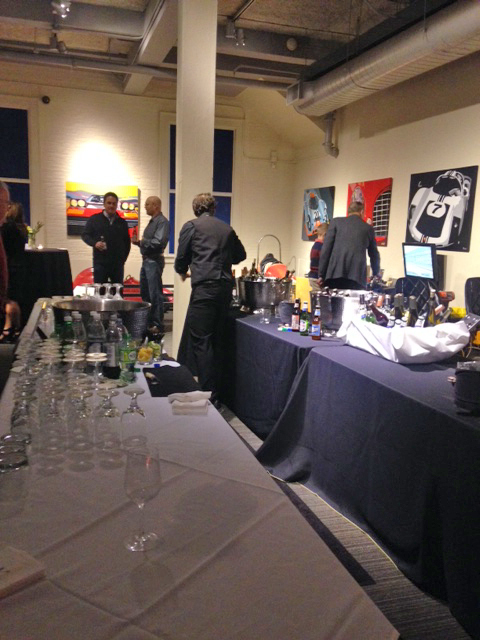 With tax and gratuity, estimated cost will be $35.00 per person paid on the day of the event. This event will be held at Home Made Theater in Saratoga Park ( http://homemadetheater.org/ ) The Pulitzer Prize winner is an explosive portrait of a southern family, celebrating “Big Daddy’s” 65th birthday. 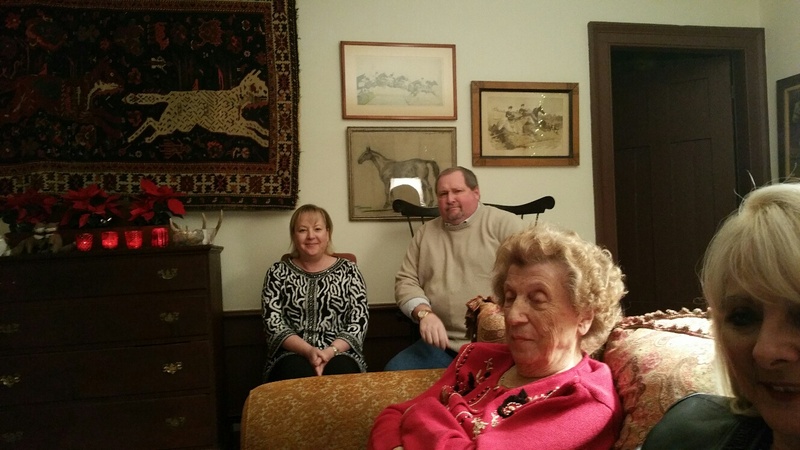 As the conniving relatives learn he’s dying, verbal fireworks and savage humor erupt. Fiery Maggie fights to maintain the facade of her marriage to Brick, a former gridiron hero, who drinks to escape her and his controlling father. 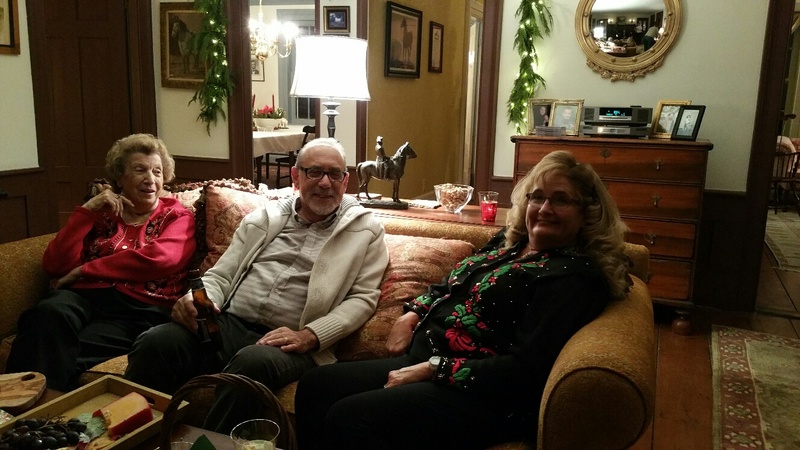 The eldest son and daughter-in-law plot to secure their place in the will. In a maze of avarice, hypocrisy and hidden desire, truths are revealed and souls laid bare. 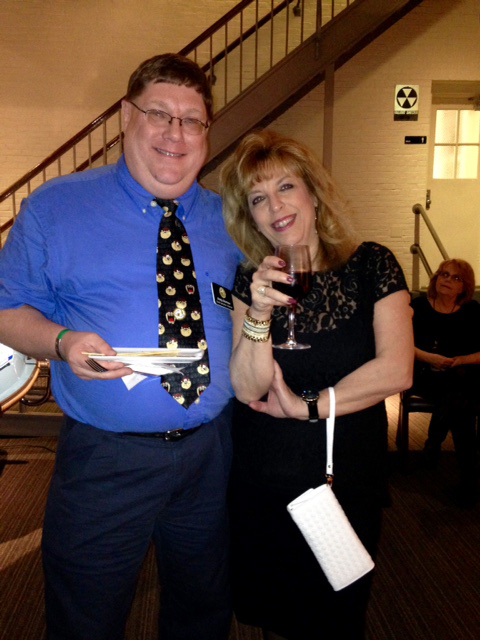 It is very important that you RSVP with a CHECK for the performance no later than January 31, 2016. (The ticket price is $27 pp) **We must receive the check on the 31st no exceptions** Make check out to: Hudson Champlain Region PCA. Checks are to be mailed to : Will Waldron, 51 Winne Rd, Delmar NY 12054-3020 or can be brought to the Sunday Brunch @ Prime on January 31st. Brunch Location TBD Looking at a new restaurant to be opening in late January. 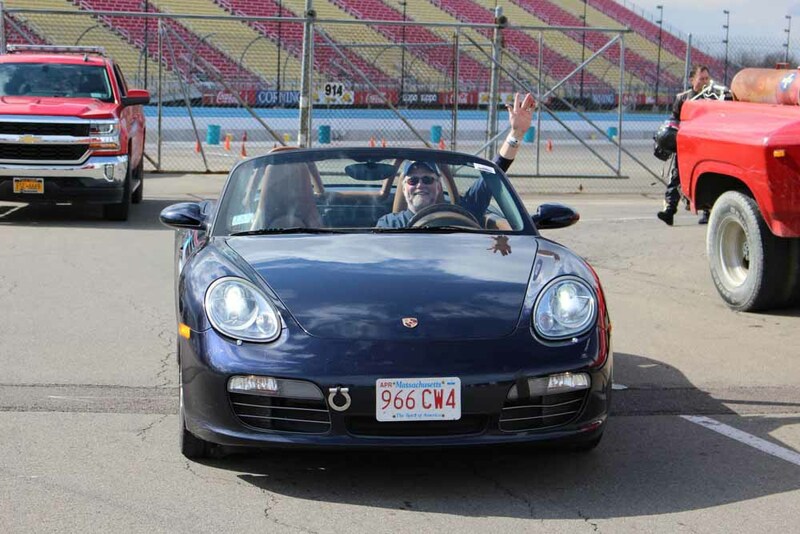 Allen Schwartz will be writing a regular humor column for our blog, which he calls, “The Long and Whining Road.” For his first article, he describes his experience at last August’s Zone 1 Autocross. 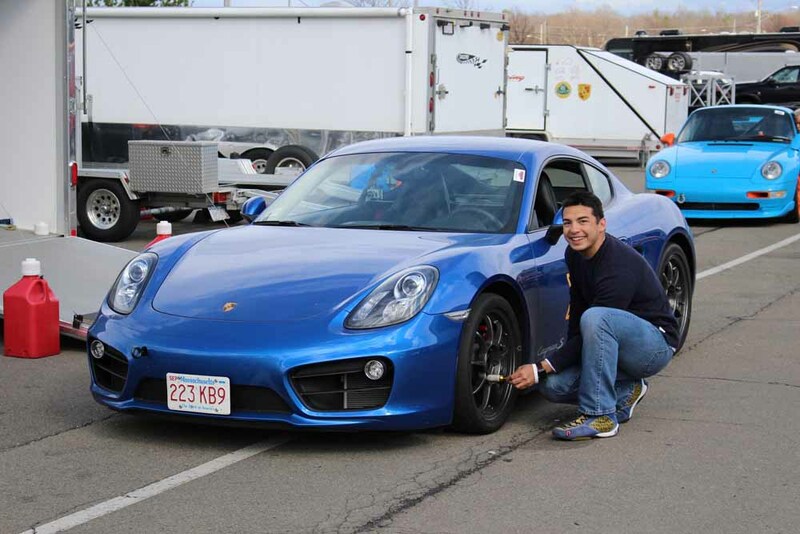 He bought his first Porsche in July 2014 and has been an avid club member ever since. 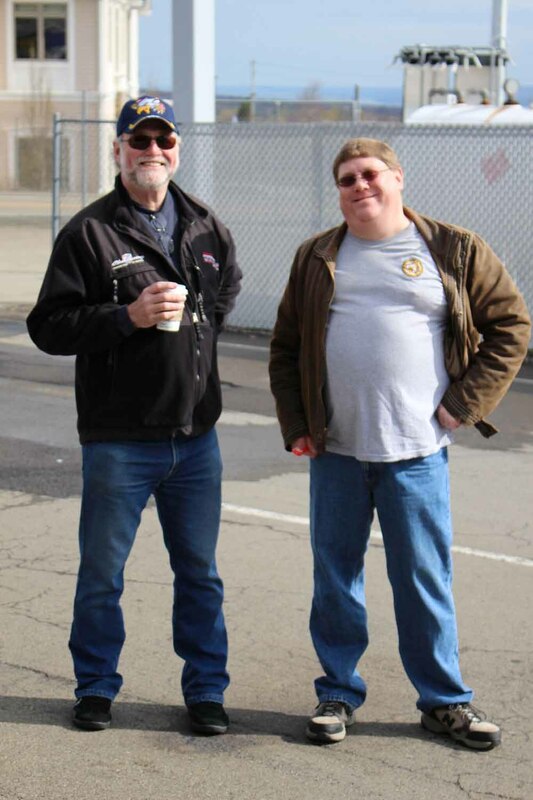 So I went up to Chris Klapper and told him, with both excitement and deep dread, that I wanted to be one of his HCP team members for the upcoming Zone 1 “super” Autocross. It was to take place August 22-23, 2015, at Moore Airfield, Fort Devens, in Ayer MA (about 35 miles northwest of Boston). 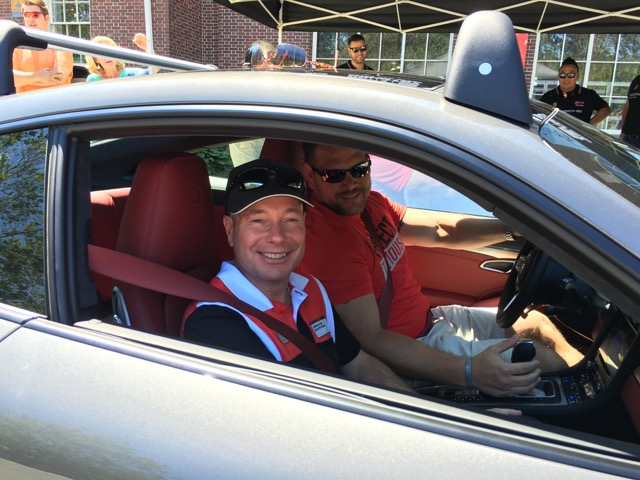 As always Chris, our Autocross chair, gave me an enthusiastic pat and a big smile. Funny, I could not detect any sarcasm. I knew he’d been trying to round up ten members to qualify as a team, and he seemed genuinely happy that I had volunteered. As I walked away I began to wonder; was he really happy to have me? 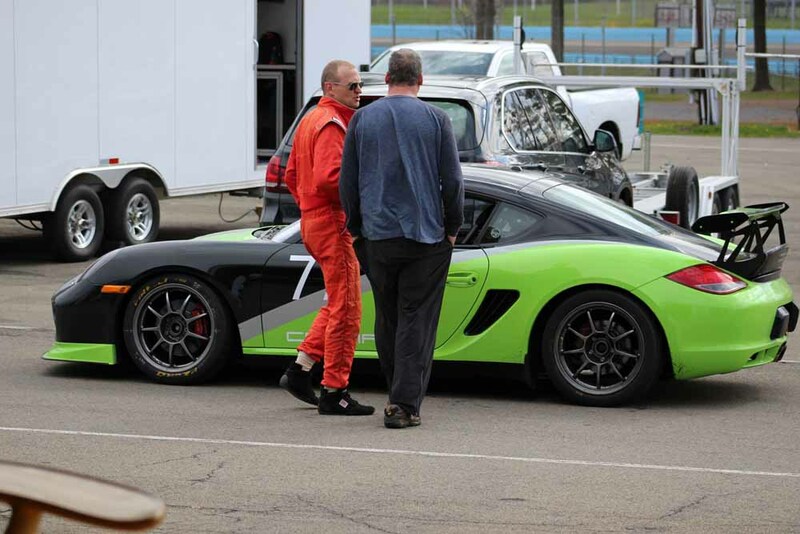 But then … why wouldn’t he be happy to have a 67-year-old novice driver, somewhat out of shape, with little experience and only a few AX and DE days under his belt, join the team? And yet, I might in some way prove useful. After all, I am a warm body, I do own a Porsche, and best of all, I’m pretty sure I was his number 10! Now that’s how to put together a top-notch team! 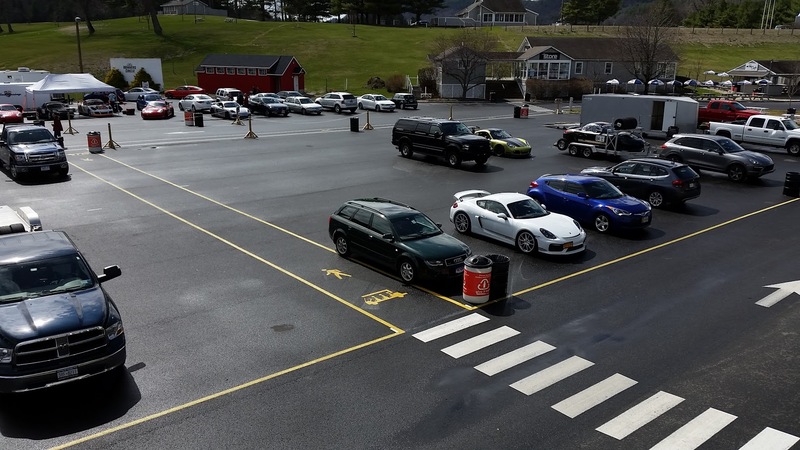 I call the Zone 1 a super Autocross because, unlike our club events that take place in a parking lot, this one is set up on an abandoned airfield! 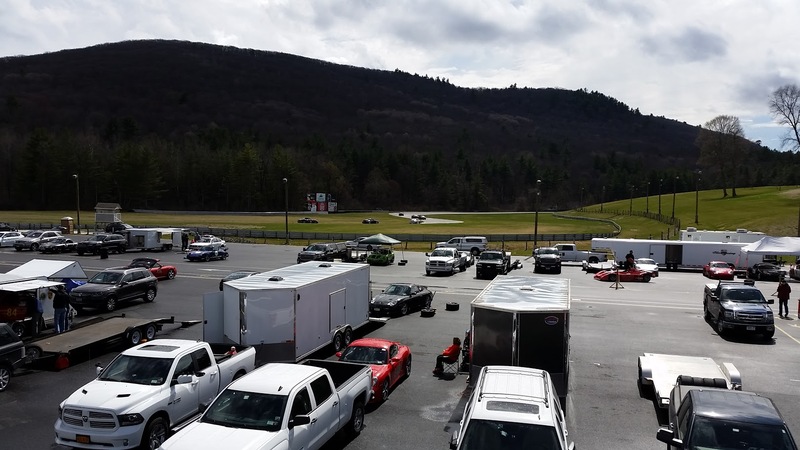 Also, it is seriously competitive, with teams from all the clubs in the northeast competing for actual points on a gigantic high-speed course. The run is so big you can actually get out of second gear and reach speeds of 60 mph or more! 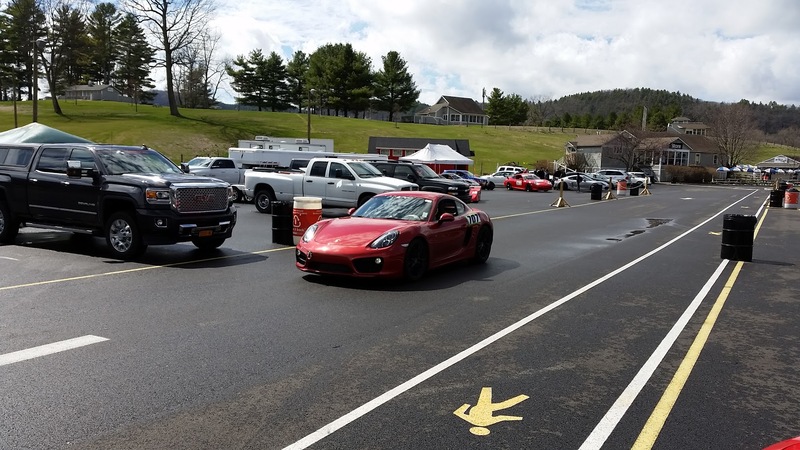 But because this was an Autocross on steroids, as the weekend of the Zone 1 approached, I got increasingly nervous about how well I’d perform (and also about my odds for an epic fail!). After all, I was just six months post-surgery and I wasn’t nearly back to normal. But making it to this race represented a significant milestone in my recovery. I had been thinking about it ever since, after my surgery, they told me it was likely I would in fact, probably, go on living! I went to the gym to prepare myself to be able to drive. I bought driving shoes. 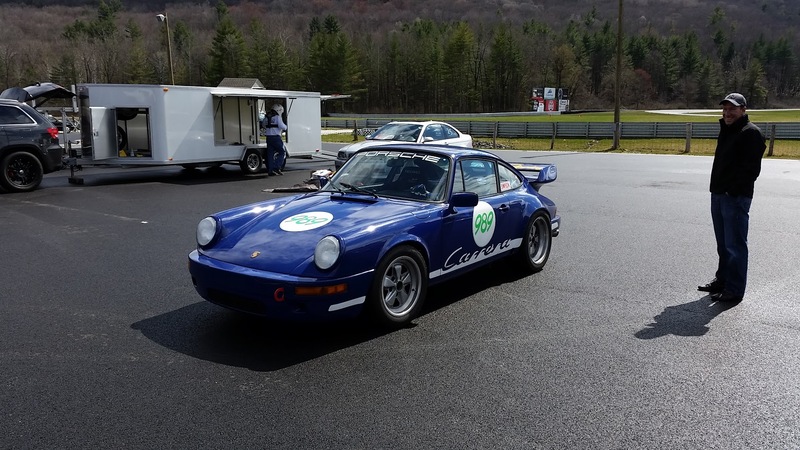 Most of all, I wanted to join the team and support our own Autocross program, even if I was going to sit at the end of the bench. On the weekend of the event, my amazing wife followed me in her SUV as I made my way to Ayers. 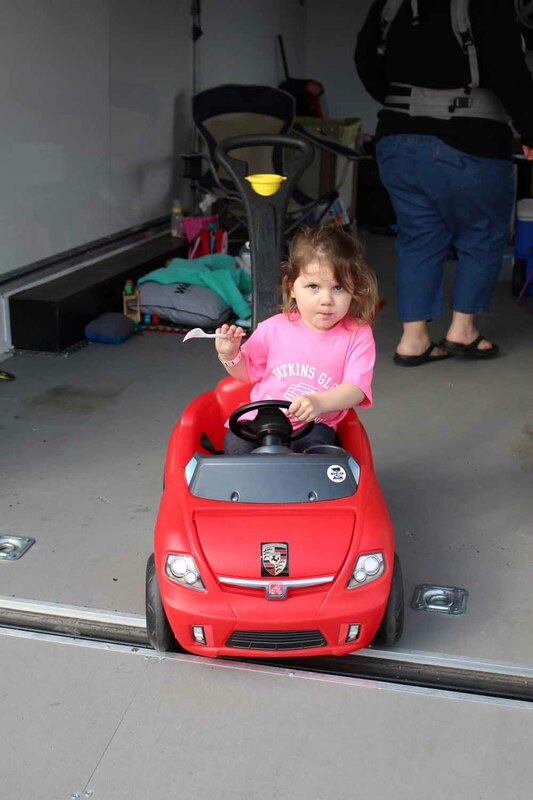 She wanted to bring her car in case she had to make a quick getaway in disguise after I screwed up. I had a long time to think about everything that could go wrong, including having a breakdown on the Mass Pike (I mean, of my car!). Somehow, we made it to Ayers. 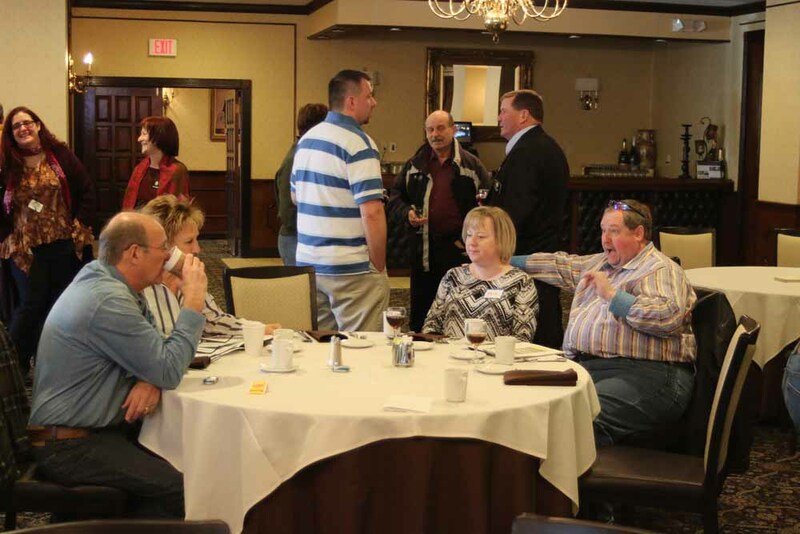 We met up with the team members at the Springhill Suites and got to know them more personally, which is certainly the best part of all these events. That night I slept fitfully. I dreamed of knocking over Cohens (not orange rubber cones, but my uncle Irving Cohen and his family). On Saturday morning, we followed a lead car to Moore Airfield, and unfortunately, I got there safely. Even worse, my car was running superbly. I was running out of excuses. 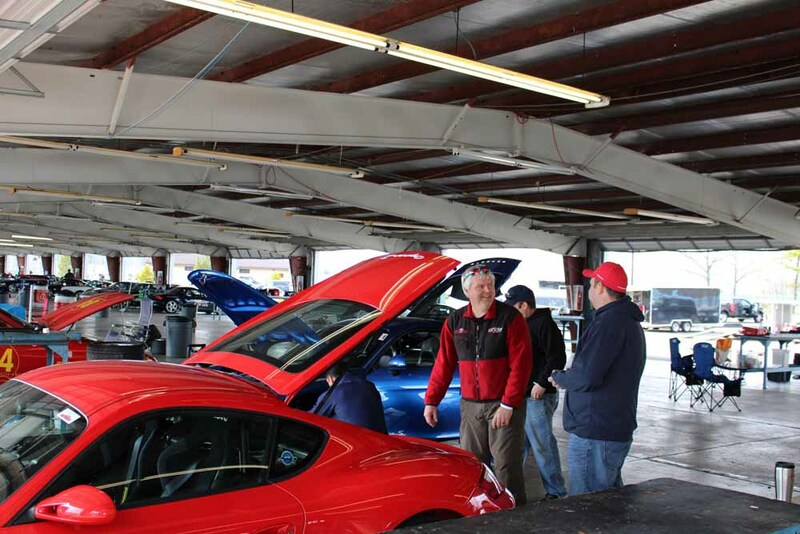 Our team members were already setting up tents and chairs, registering, and getting their cars checked out. I always feel like I’m 15 minutes behind at every one at these events, but I hurried up and got registered, picked up the wrong size t-shirt I had once again ordered, and went through the tech line. Scanning the landscape, I was totally intimidated by the gigantic size of the course (it’s laid out on a triangle of concrete made up of two runways and a taxi lane), and also by the huge number of high-performance cars that had shown up (about 90). 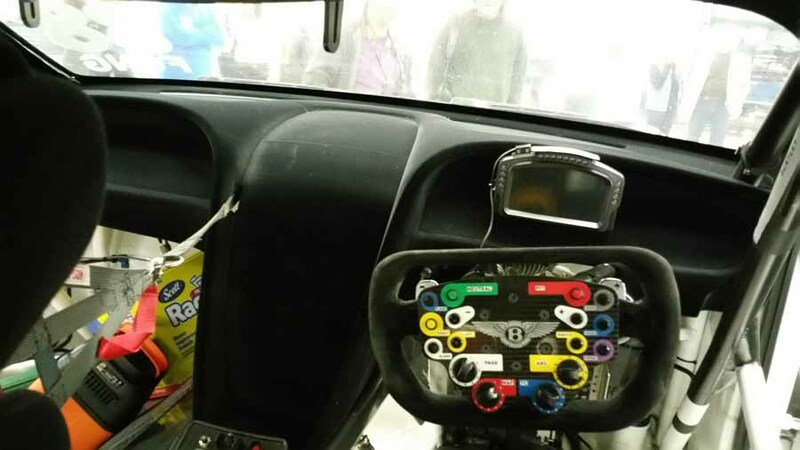 There were a lot of serious drivers. 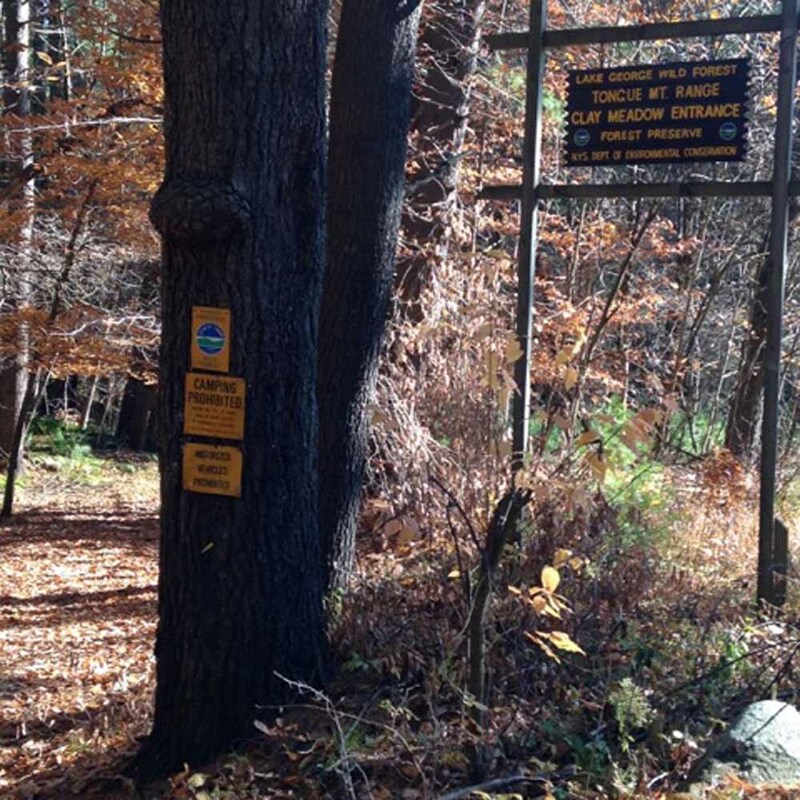 Zone 1 encompasses several regional clubs, like our Hudson-Champlain affiliate, that are in the northeast. Now, I didn’t do a lot of research for this article, so I’m not sure exactly how many clubs are in Zone 1. Look it up yourself. There’s a map. I’m busy writing the rest of the article. Everyone set off to walk the course at about 8 o’clock in the morning. I wasn’t sure I had the energy, so they offered me a ride to preview the course. It turned out my ride was in the cramped back seat of an old pickup truck that I shared with a gentleman who was celebrating his 94th birthday, and needed a lift more than I did. 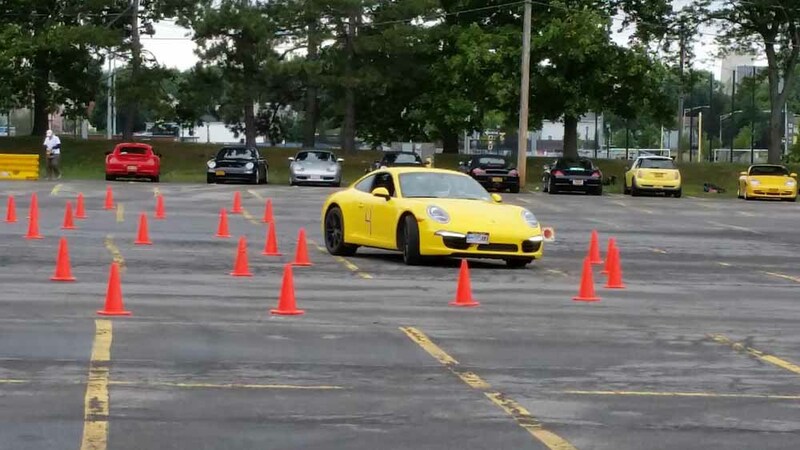 The problem with the “drive through” was that the truck did not actually drive through the cones because the course was covered with people already walking through the cones! The truck went through some cones and around other cones. All of it was quite confusing. Memo to self: this is not a good way to learn a course! We were divided into classes and groups, in a way that I will never comprehend. 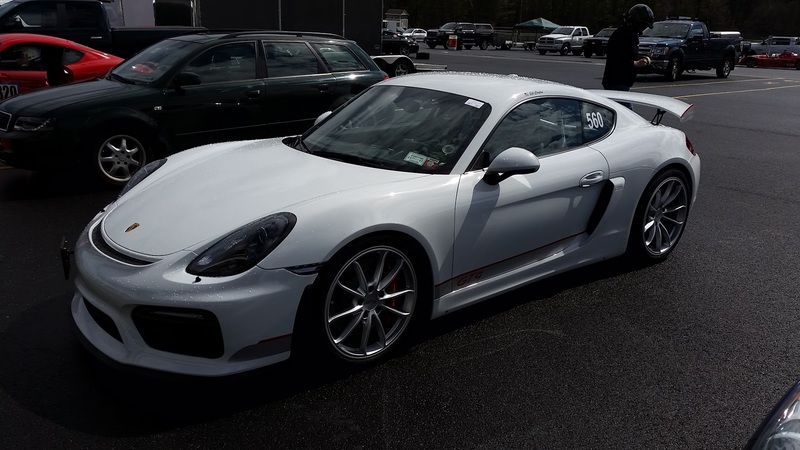 It seems to me there are more Porsche models with three numbers then there are area codes in the United States – 356, 911, 912, 914, 918, 924, 944, 959, 958, 991, need I go on? And those are just the consumer models, not the racing models! And then, within a single area code, they’re grouped by whether they’re stock or modified, by horsepower, by the number of children you have, the number of times you’ve been divorced, and so forth. In any case, my class was S2 (my last name is Schwartz, I have 2 kids, and am still married – see, you didn’t believe me!). S2 is basically for stock cars with low power. 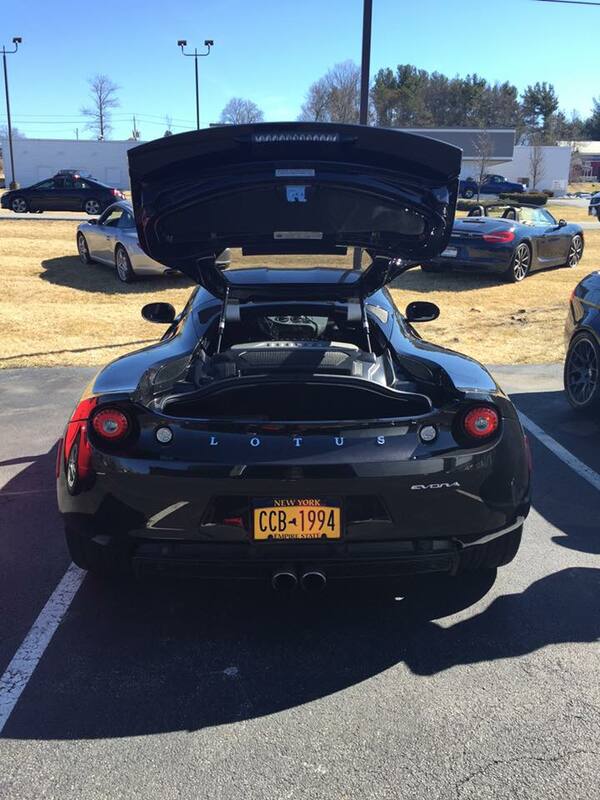 I have a 2005 base Boxster with about 240 hp. I’m not complaining, but on the track, when we get to the straightaway, guys blow by me like I’m riding a Briggs and Stratton. 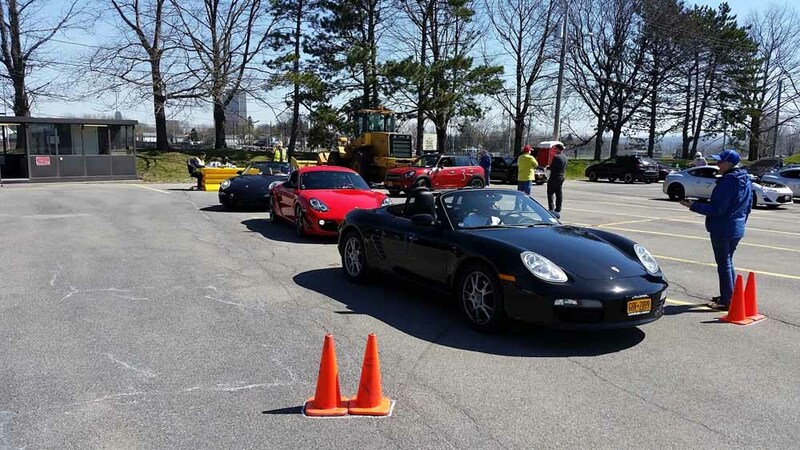 But in Autocross, power means very little. It’s about being smooth and finding the best line that wins this kind of race. My group finally was called and I got in line. Chris gave me my last minute instructions. “Don’t mess up!” he said. (No, he actually said to take the first run slowly and study each element of the course, as he always does.) I did take my first run very slowly, and after I was finished, the powers that be told me I was off course. 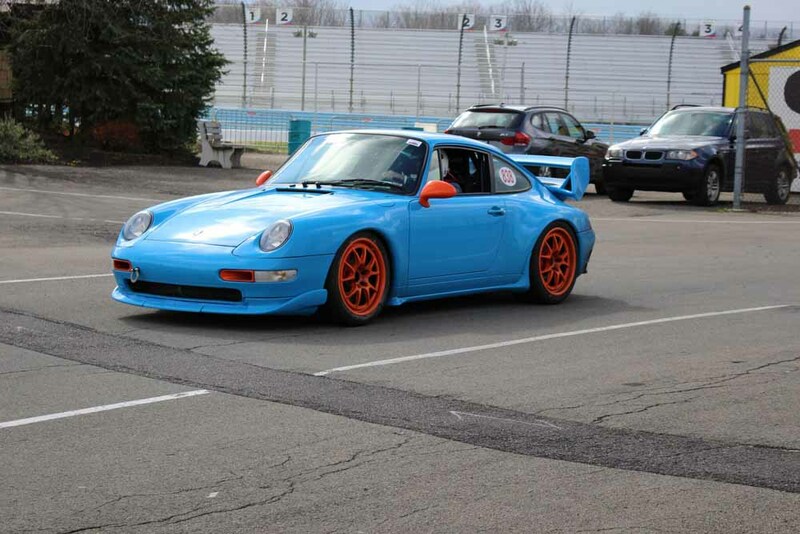 But I knew that I had missed one cone at the very beginning, and was pretty happy with the rest of my run. Sure enough, my second pass at the course was clean! I had posted an official time, and amazingly it was even 10 seconds faster than my first off course run. 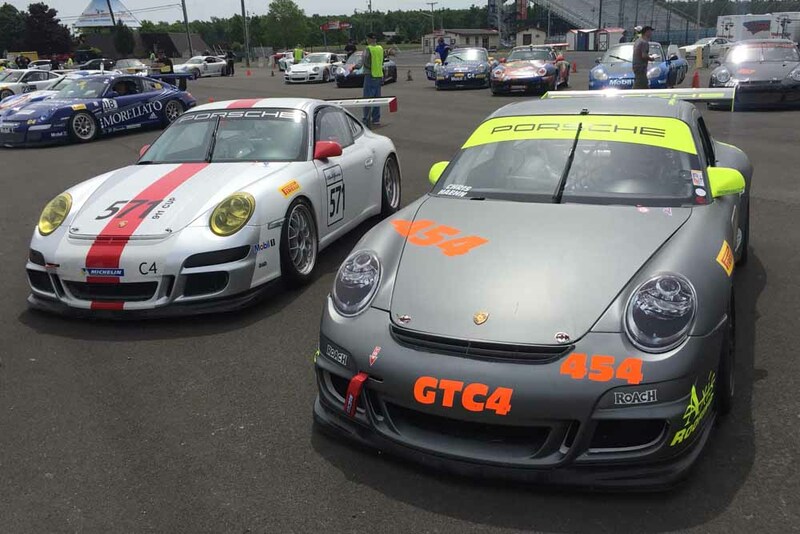 Just so you don’t get the wrong impression, my time was still 30 seconds slower than the more experienced drivers. But at least it would count! Feeling confident for no good reason, I cranked up the speed on my third run. I got called off course again. Now, this is where you start to question your sanity, because my second run was clean and now I wasn’t sure where I had made my mistake on run 3. See, the thing about Zone 1 is that it is highly competitive, and therefore no one tells you where you went to off course or which cone you missed! So it’s totally up to you to figure it out and fix it. On run 4, I was off course again, and was told it was at the same place, but not where that place was! With my anxiety soaring, in a fog of confusion and regret, my final four runs were all off course. Exasperating! Chris and Aaron Ambrosino graciously tried to console me and help me decipher where I had gone wrong, but the course is so long (over 1.2 miles) that you cannot see most of it from the pit area. I had found out something that experienced Autocrossers know: Try as I might, it’s nearly impossible to correct a mistake once you’ve learned it! Needless to say, one clean run out of eight was not the performance I was looking for! Several of my teammates shared with me similar experiences they’d previously had, but it helped little. I was so disappointed! My charming wife was not upset in the least. “You screwed up. Get over it,” she said. “You’ll do better tomorrow, probably,” she added, and like always, I tried to believe her. After enough hand wringing, I steeled myself! I would meet the challenge, rise to the occasion. Finally, I put my energy into developing a strategy for Sunday. 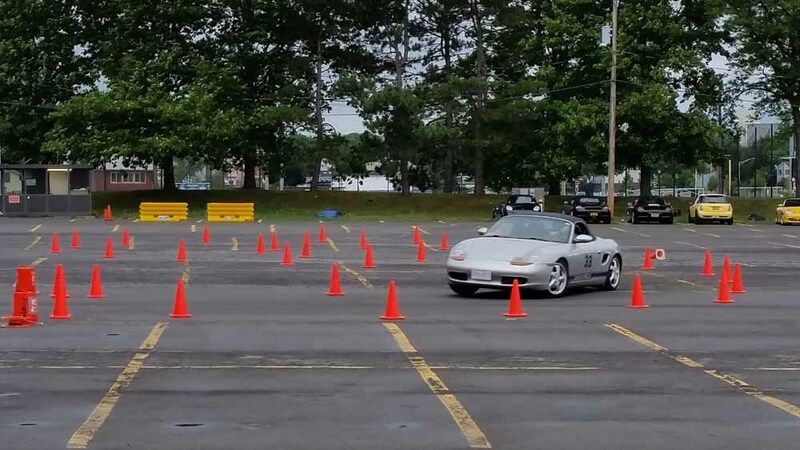 A big part of autocross is being able to learn a course quickly, remember all its elements, and drive it over and over again, faster with each run. I woke up Sunday in a cold sweat. What if I simply couldn’t learn a long AX course quickly enough to be competitive? What if I continued to go off course? What if that 94-year-old guy kept beating me? My plan for Sunday was to begin differently, by walking the course. Even though it was over a mile long, the walk was surprisingly easy, and Chris walked it with me, pointing out various cues to attend to and the best line to take. 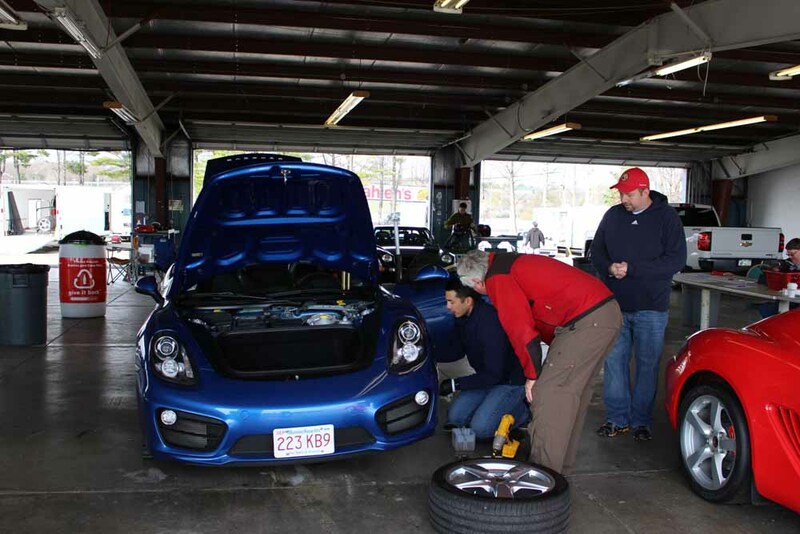 Autocross demands intense concentration for 60 seconds, and that requires you to get into that Zen-like “zone” of relaxed focus. I meditated in my car. I breathed deeply. I sought perspective! 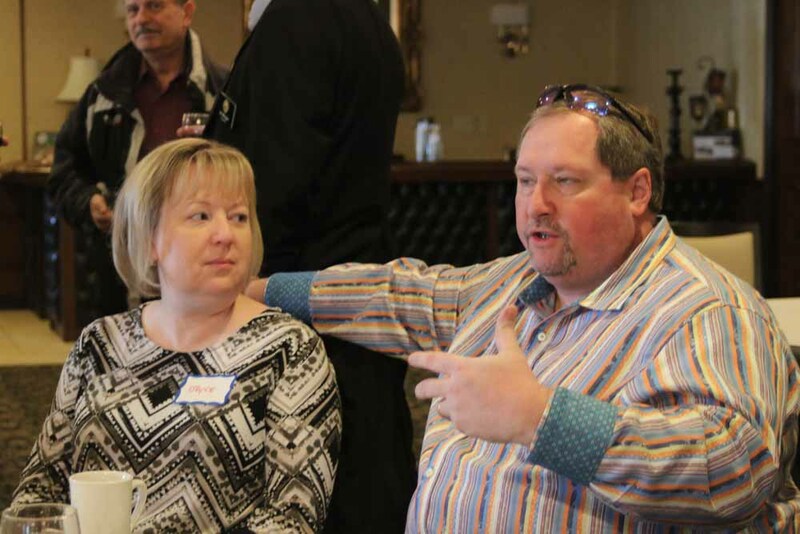 As my lovely wife had told me Saturday night, “You can always sell the car and never see these people again!” She is so smart! On Sunday, I took my first run slowly, so I could be sure to learn all the gates and slaloms and visualize them clearly. My time was slow, but I stayed on course! Chris raised a single finger – thumbs up, not the other one. On my second run, I tried to add speed, but went off course. I panicked. Was this going to be a repeat of Saturday’s horror show? 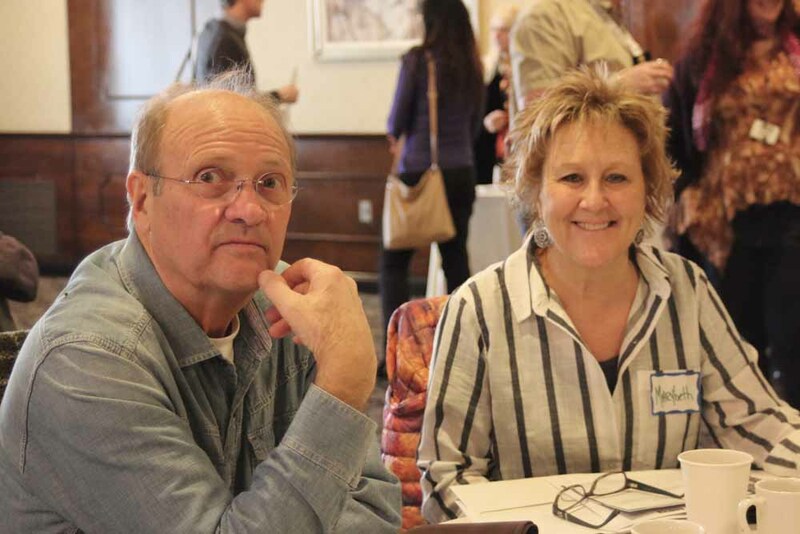 Chris came over and encouraged me not to over drive or over think the course — that I had done it already and could do it again if I merely stayed confident. Easy for him to say. Yet my third run felt like my best yet! As I pulled off the course and found out my result, I began to wave my arms wildly. 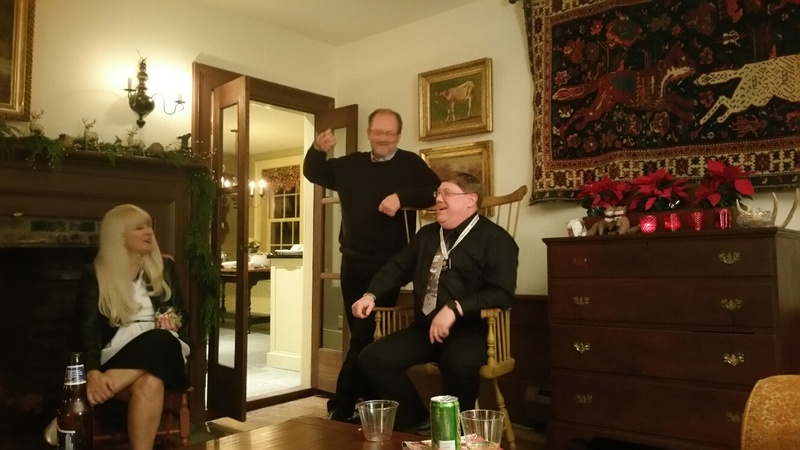 Chris and several of our team members came over and high-fived me, which is typical of the camaraderie shared by our club members. Finally I was staying on course, and my times were getting better! On my fourth and fifth runs, I remained clean and improved by about five seconds each time. We only did five runs on Sunday because of a coolant spill that had to be cleaned up, but of my five runs, I was on course four times, and continued to lower my times with each run. That is what Chris preaches, and he was truly happy for me. I had overcome my self-doubt, and most important, was able to contribute one point to our team by posting an official time for each day! 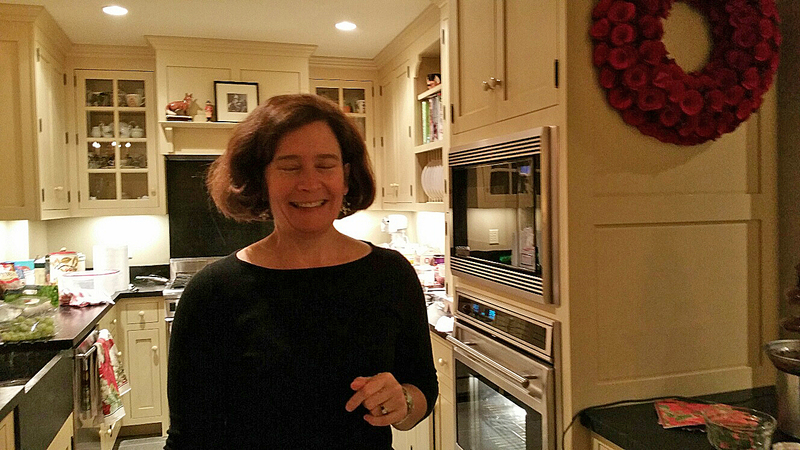 I felt like a 10-year-old who scores a goal for his soccer team, except I’m 67 and can’t run. It felt good, which is what this is all about! To summarize my experience: I literally went from despair to redemption in 24-hours. I had challenged myself and succeeded. I had fun! Other than winning your argument with the IRS, where else can you feel such exhilaration? 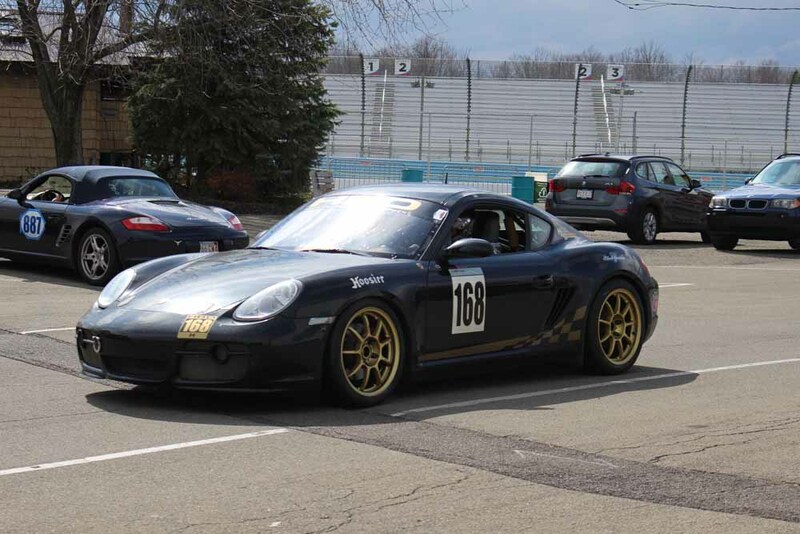 Now the 2016 Zone 1 Autocross cannot come soon enough! 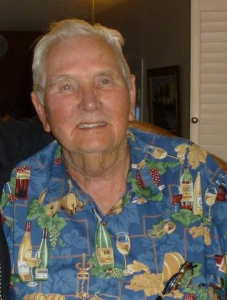 Porsche lost a great friend when legend Shep Adkins died this past August at the age of 90 at his home in Morro Bay, California. 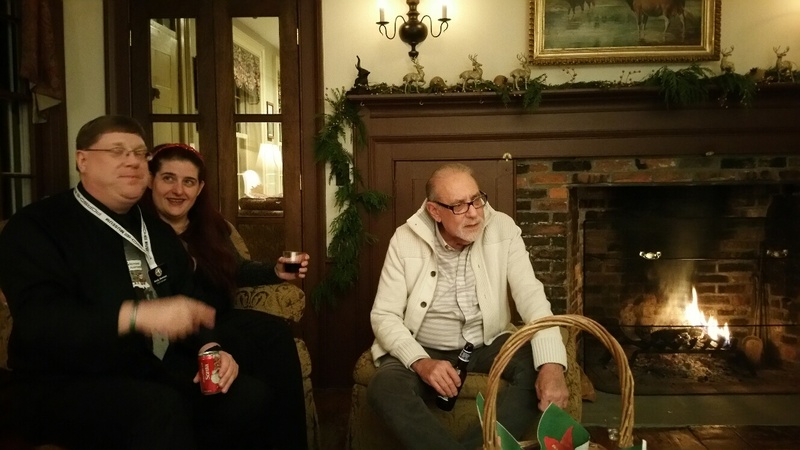 I met Shep in 1957, when I was 14 years old when he visited FoCastle Farms our family farm in Burnt Hills, N.Y. for a week-end stay with his 356 Super Coupe. 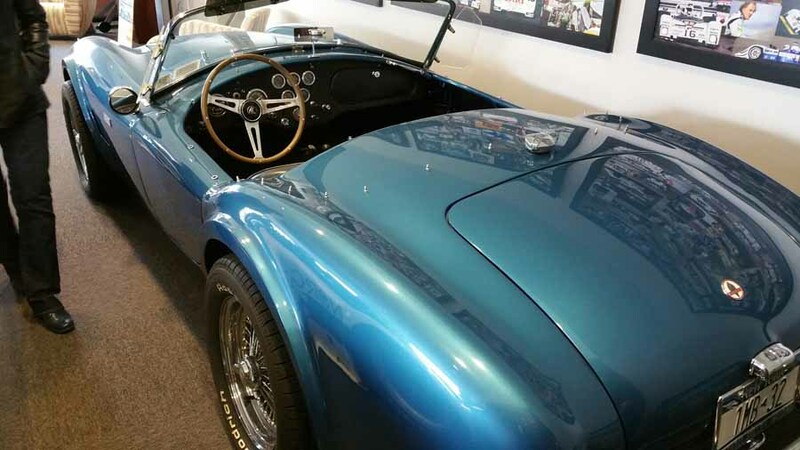 My father was an avid sports car enthusiast and was driving a Jaguar XK-120 at the time. 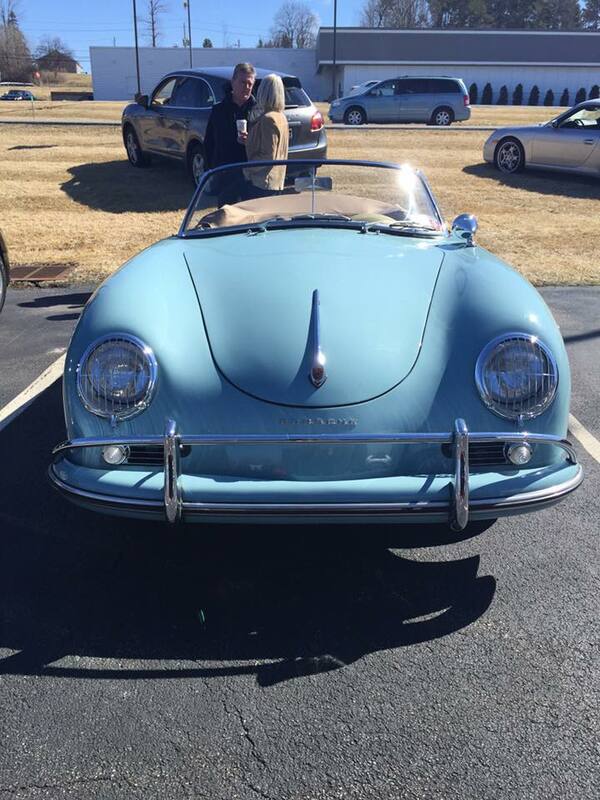 Once my father drove Shep’s Porsche, “our lives changed forever. 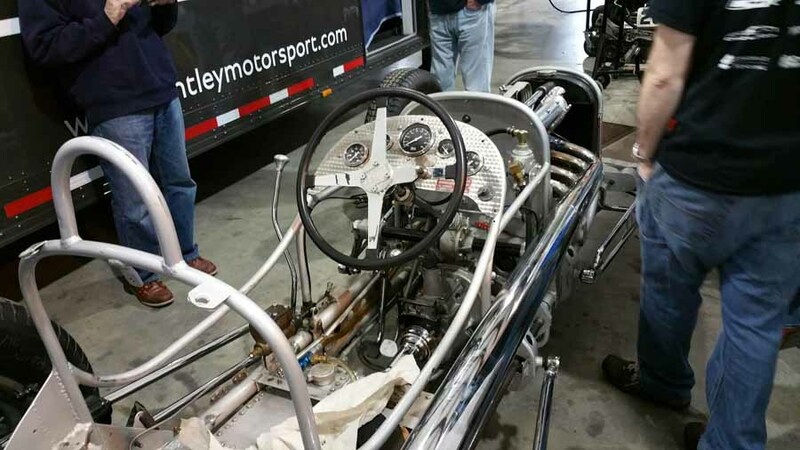 A South African native, trained as an engineer, Shep became interested in automobiles at an early age, having seen the Type C 16 Cylinder Auto Union Car race in the South African Grand Prix in Cape Town in 1936. In South Africa, Shep raced Manx Norton motorcycles and rode the Isle of Man on a long-stroke Sunbeam. 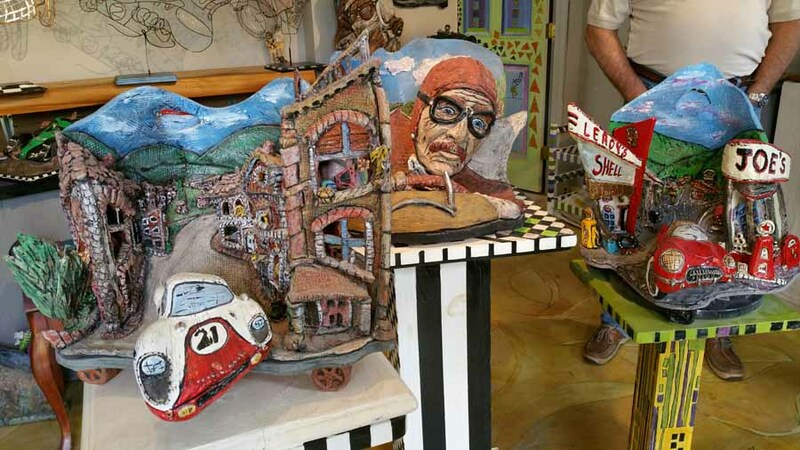 He came to the U.S. in the mid-fifties and after settling in the Boston area, formed the Northeast Region of PCA. 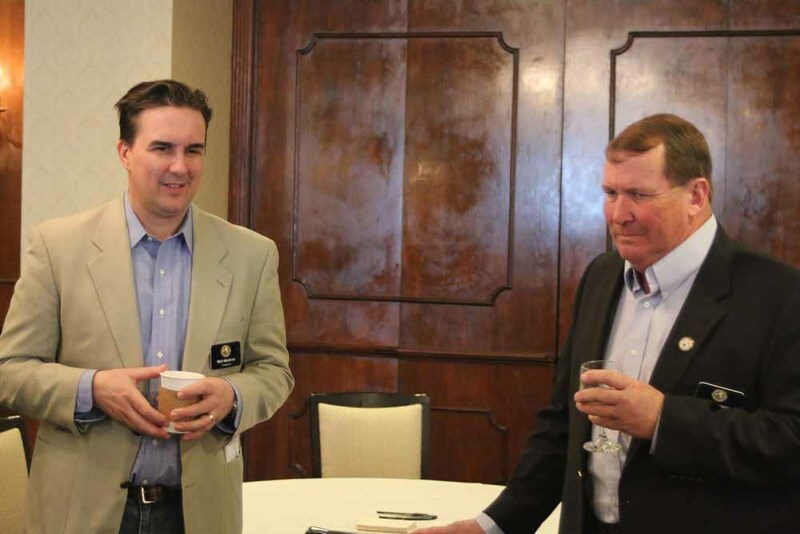 Next move to Akron, Ohio, in 1959, and sure enough, an Akron Region of PCA was born. 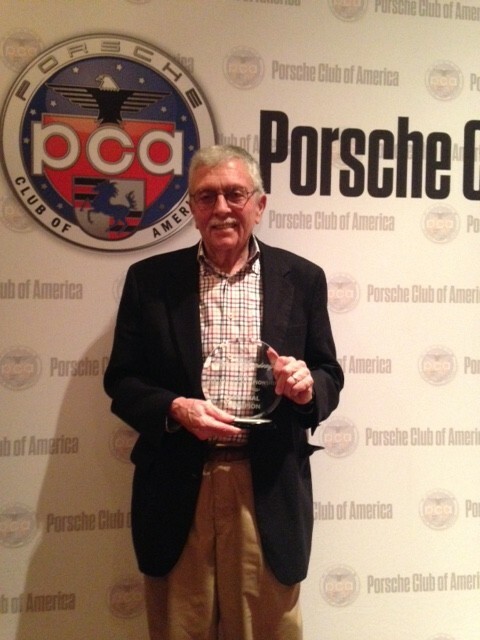 PCA Member number 15, Adkins is credited with founding 8 early Porsche Club Regions. Owner of 36 Porsche’s over the years. 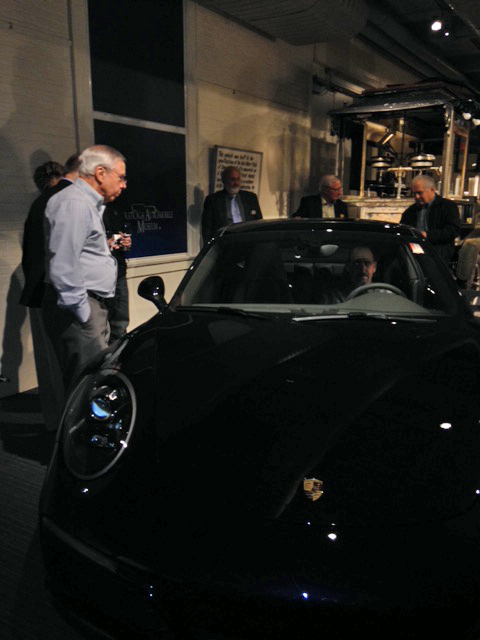 And Adkins tells the marque’s truth: “Porsches are appealing because they attract wonderful people who become longtime friends” I can attest to that, as Shep and I have stayed in contact and remained Porsche friends for 58 years. 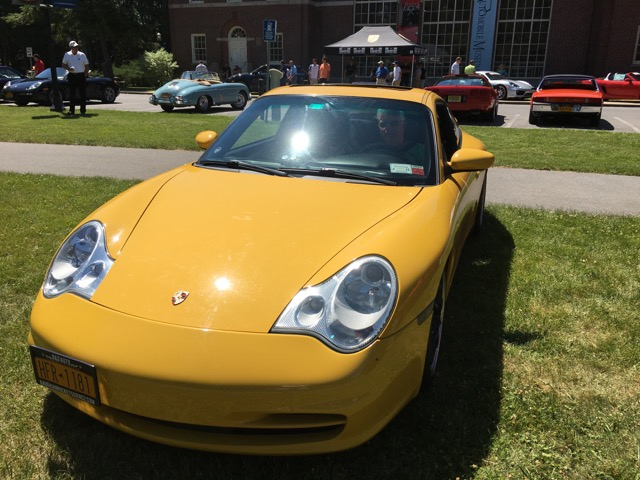 The die was cast, my father sold the Jaguar and purchased a new 1957 356 normal coupe, we joined the Hudson-Champlain Region of the Porsche Club of America (I have been a PCA member for 58 years). 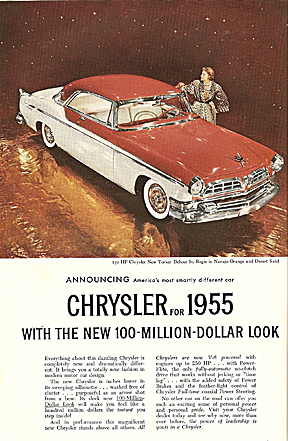 In 1961 I purchased a brand new S-90 Roadster at the age of 18. I was determined to start racing, but at that time you had to be 21 to race in the U.S., so I went across the border and raced in Canada. 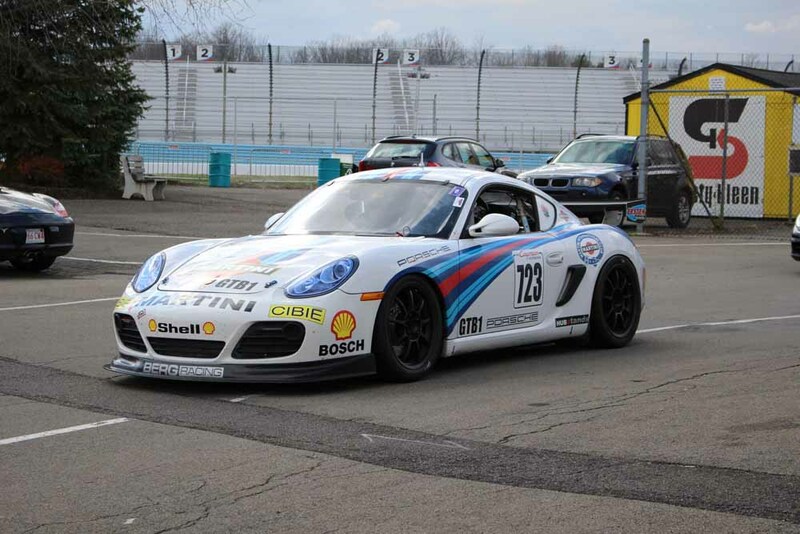 Thus began my fifteen year career racing Porsche’s. Always raced Porsche’s, after the S-90, I had a 1962 356 2-liter Carrera GT which I raced in C-production with my good friend Bruce Jennings and raced the car in the Sebring 12 hours with John Kelly co-driving with me for a 1st in Sports. 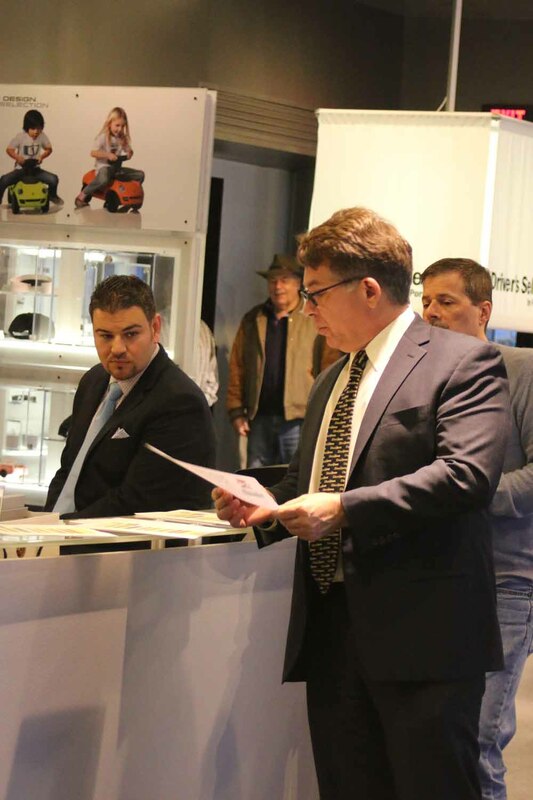 During this same period, I started my business B&B Motors selling Porsche accessories and racing safety equipment. 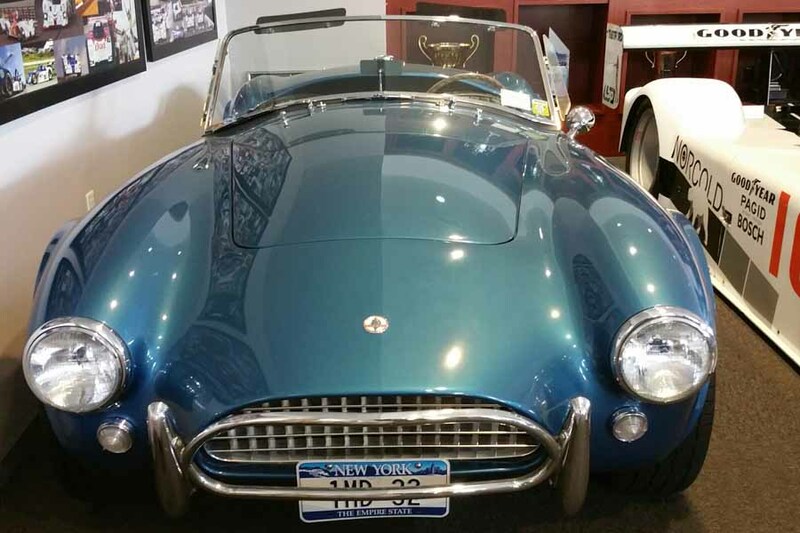 We distributed Bursch tuned exhausts, Koko floor mats, sway bars & roll bars. 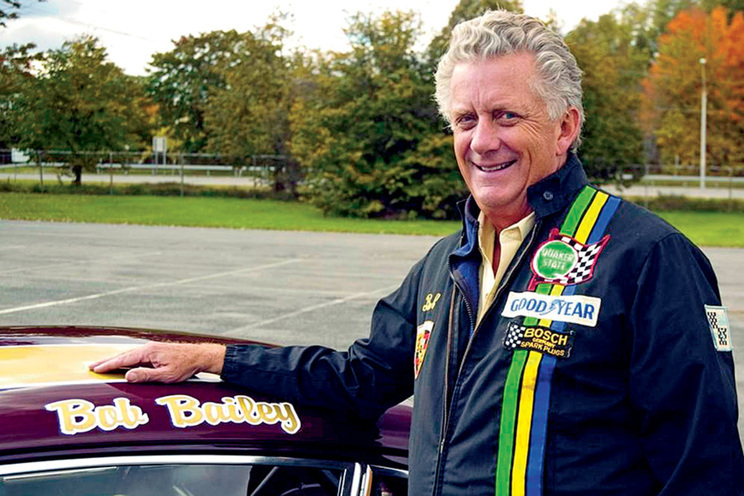 When DuPont developed Nomex flame resistant fabric, B&B was one of the first companies to manufacture racing suits. 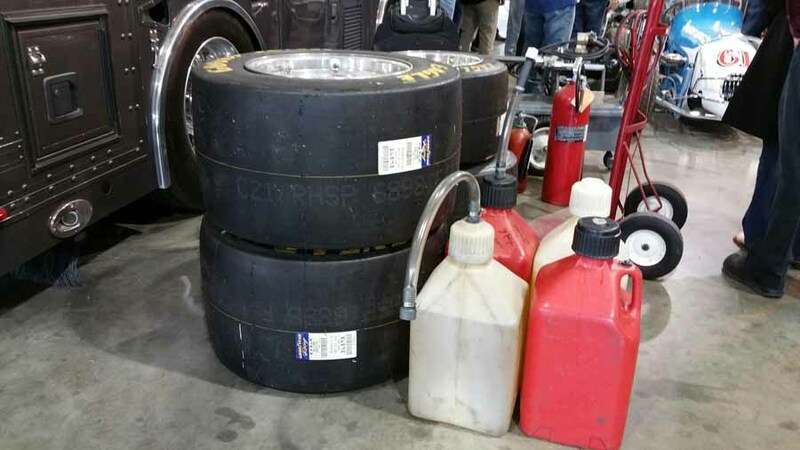 At that time we supplied Goodyear Racing with all their driving uniforms. When I raced my factory 911 lightweight in the Trans-Am series in 1967 thru 1969 I became good friends with Mark Donohue and became business partners and formed Racemark International. 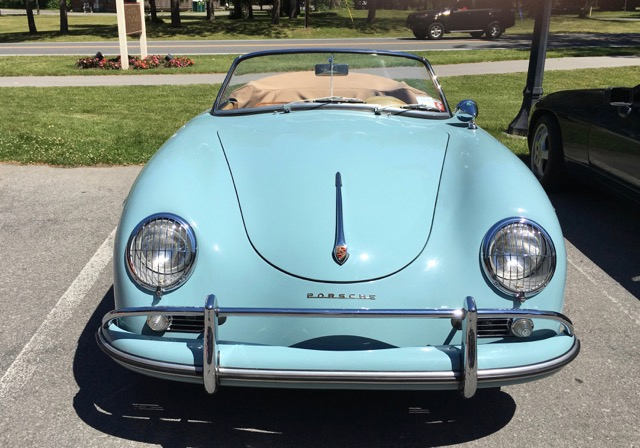 I met my wife Ginger in 1968 when she was at Skidmore College in Saratoga, N.Y. and brought her 356 Cabriolet to my race shop for repair. Quite extraordinary, how that week-end in 1957 meeting one Shepperson Prescott Adkins at the age of 14, set in motion a chain of events all centered around Porsche, my racing career, my business, my marriage of 43 years. Thank you Shep and God Speed! 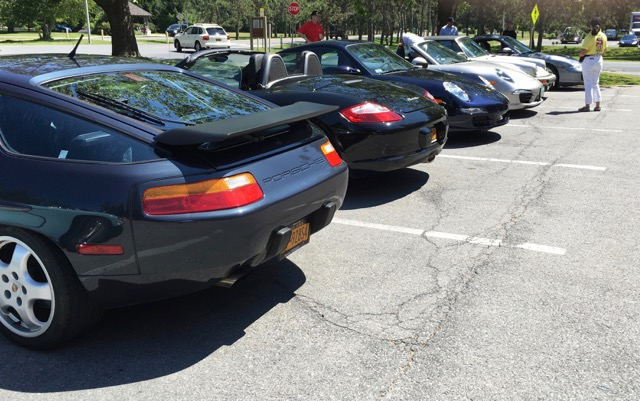 If there’s one thing the over 600 members of our Club have in common, it’s a love of cars and a belief that Porsche makes some of the finest automobiles in the world. 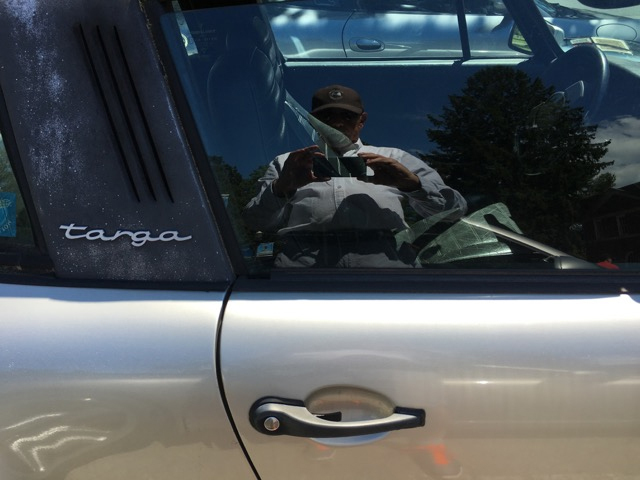 Even so, there are other capable and entertaining cars on the road; Club member and 911 Carrera owner Paul Budlong reflects on what it’s like to drive one. Recently I was out to lunch with a friend. 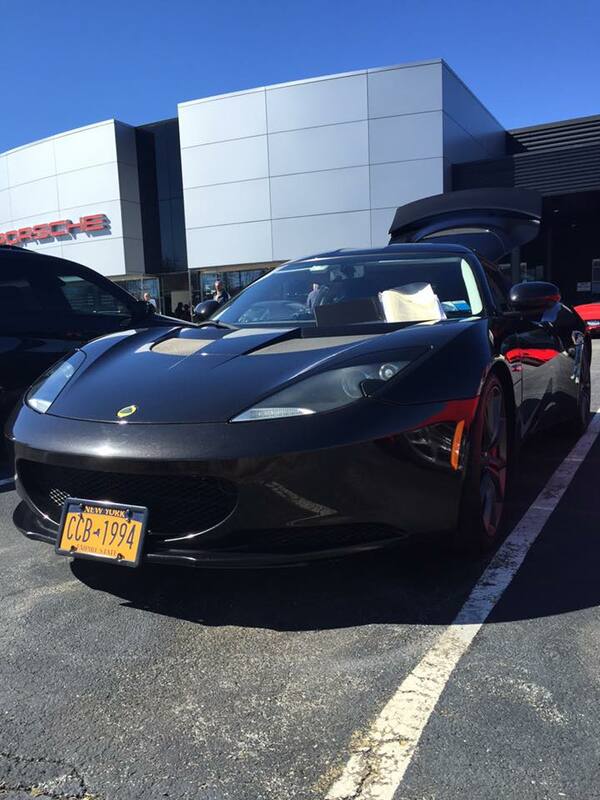 While we were eating he mentioned he had purchased a Porsche about a year ago after already purchasing another sports car. 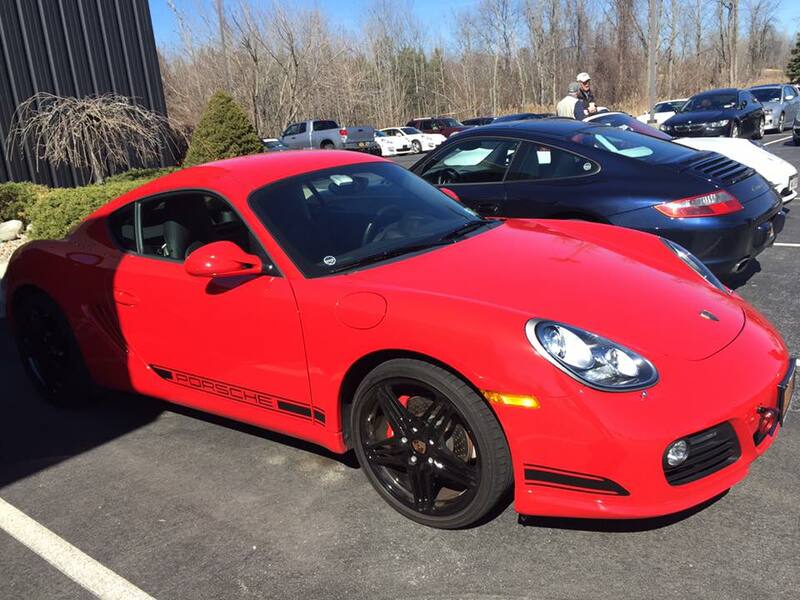 He received a call from a salesman with whom he had been in touch about purchasing a Porsche. 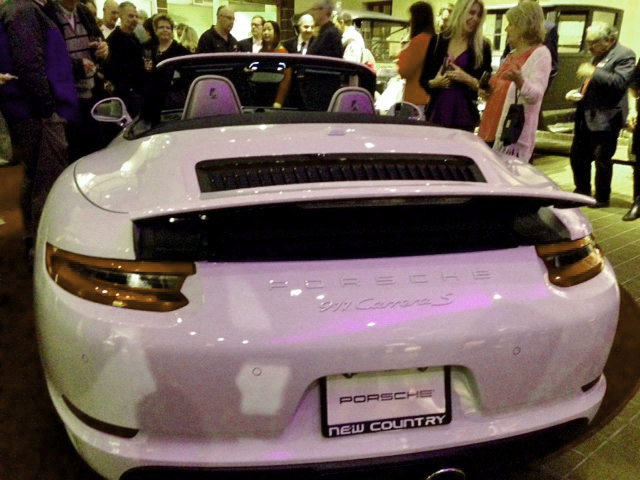 The salesman told him a Porsche was available- would he like to take a look at it? 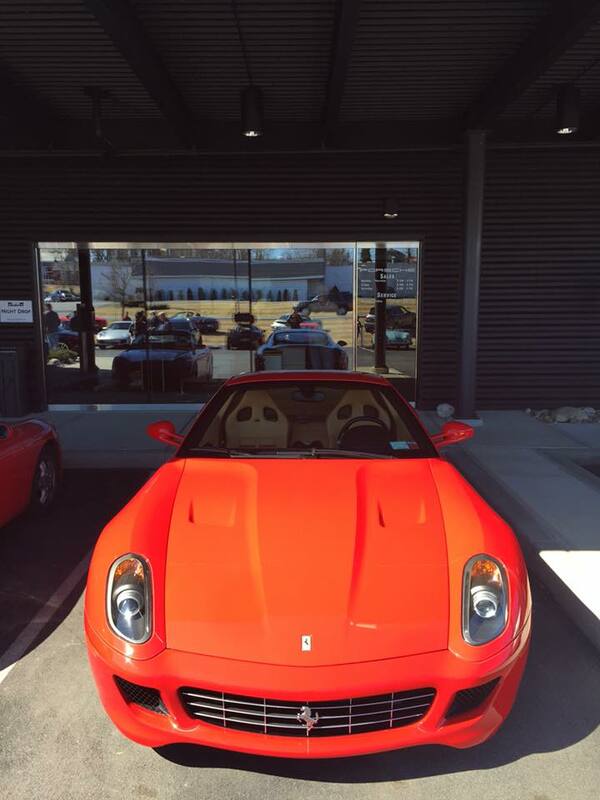 Having purchased another vehicle since their initial conversation he hesitated but then decided to take a look. 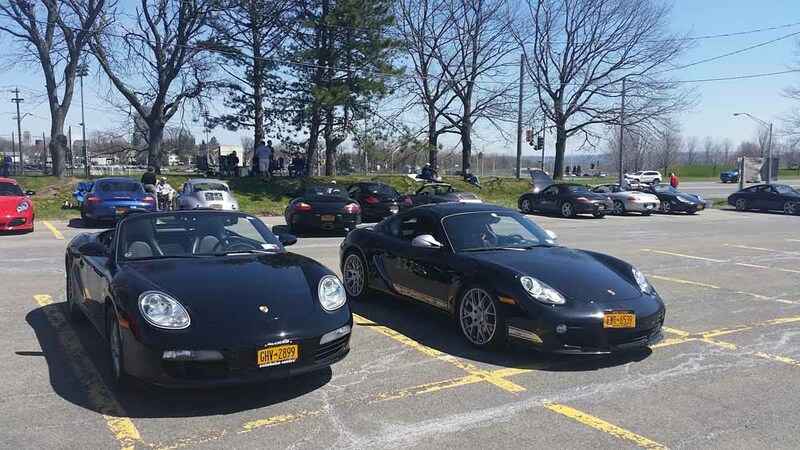 He told me that after seeing the Porsche he decided to buy it even though he had the other car. 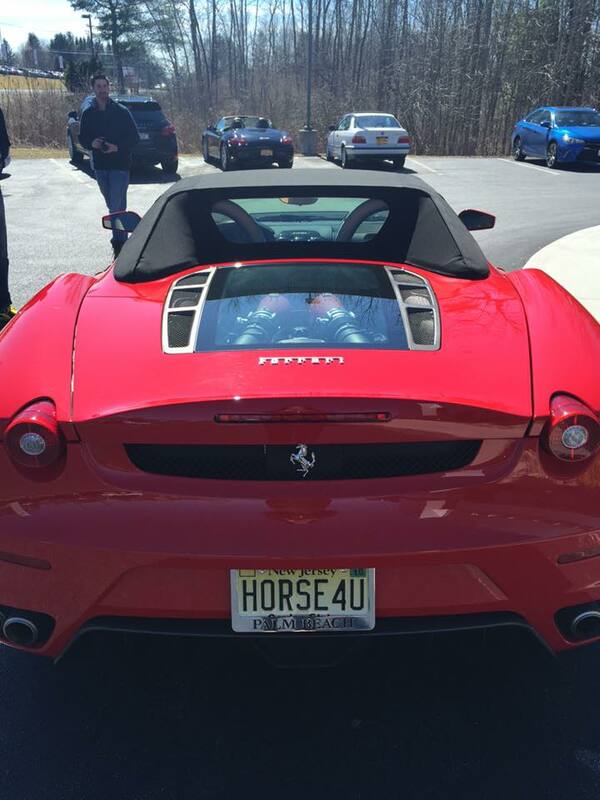 That was no surprise to me-we all do that with our cherished rides. 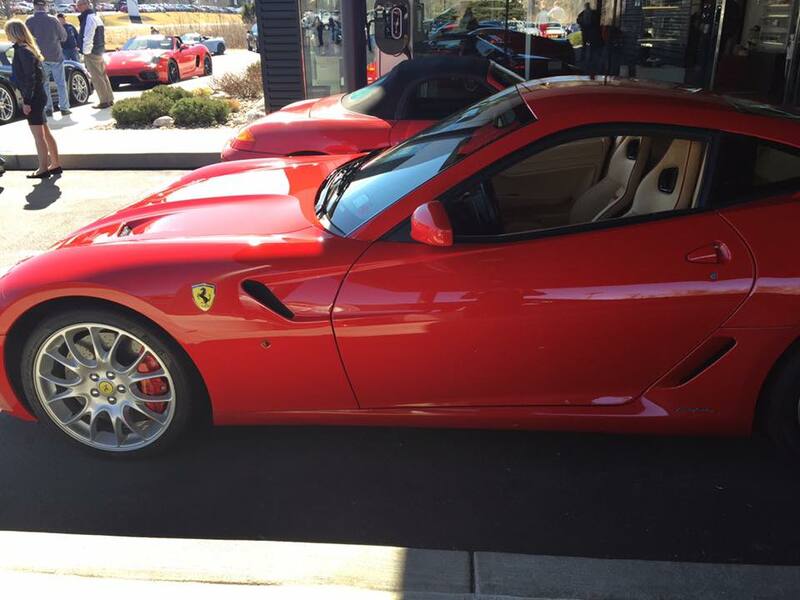 The day we had lunch my friend had driven his other car. He asked if I wanted to take a look. I kept looking for what I thought would be his car but we were running out of vehicles when he said to me, “well, what do you think?” I said, “the Vette?” he smiled and said, “that’s it”. 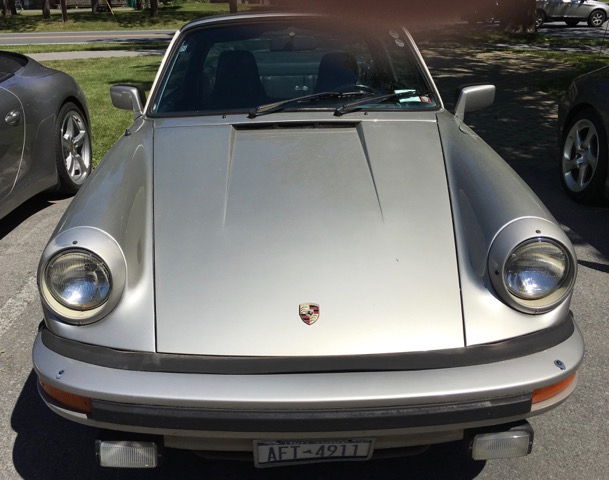 Now I have been a Porsche lover since my first one in 1970; but, before that I was a muscle car kid who loved any kind of car that went fast and preferably made a lot of noise. Hot Rods, Corvettes, Muscle Cars, whatever; just make it fast. 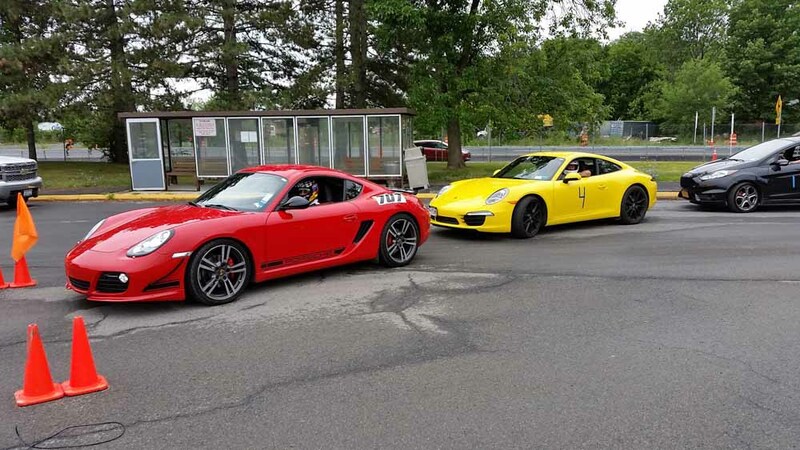 All of a sudden, without any filtering of my reaction or tempering of my response, I said, “wow, super!” I may have surprised him, after all we are Porsche owners. He opened the driver’s door and said, “get in”, which I promptly did. Now I have been watching Corvettes the last seven years or so, coming of age at Le Mans, and have been feeling a little weak in my allegiance to my Marque even though I feel great behind the wheel. 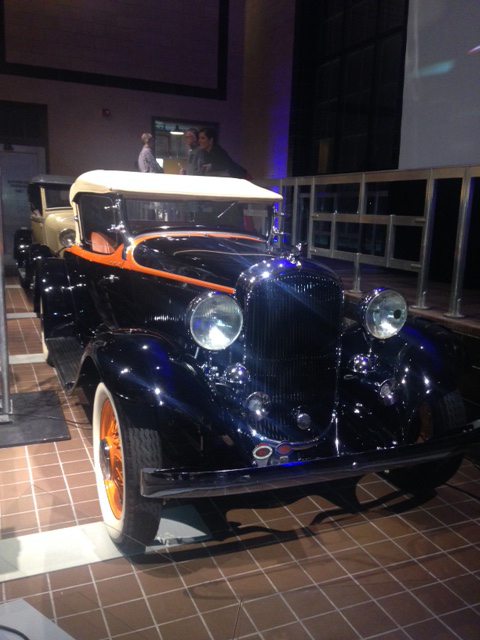 “Would you like to drive it?” “Love to!”came out of my mouth before I could be coy. 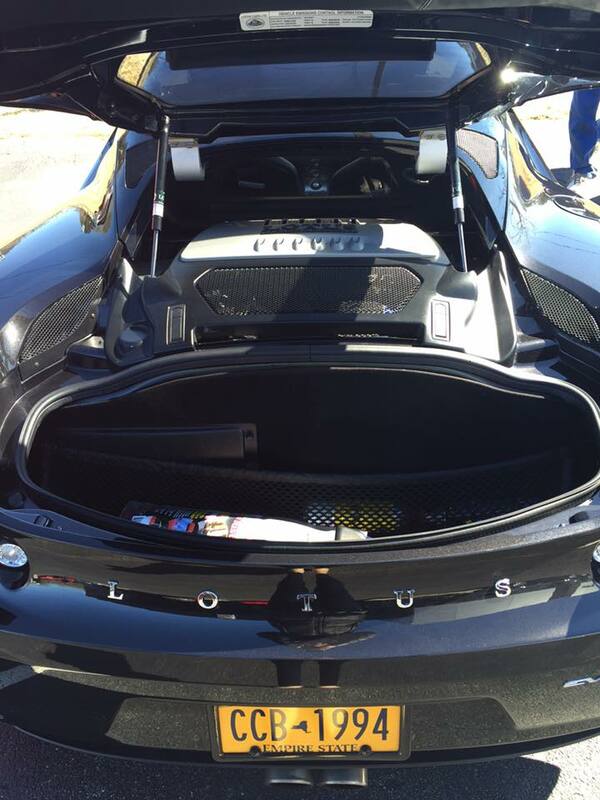 The car is a late model though not the new Stingray. The inside surprised me. 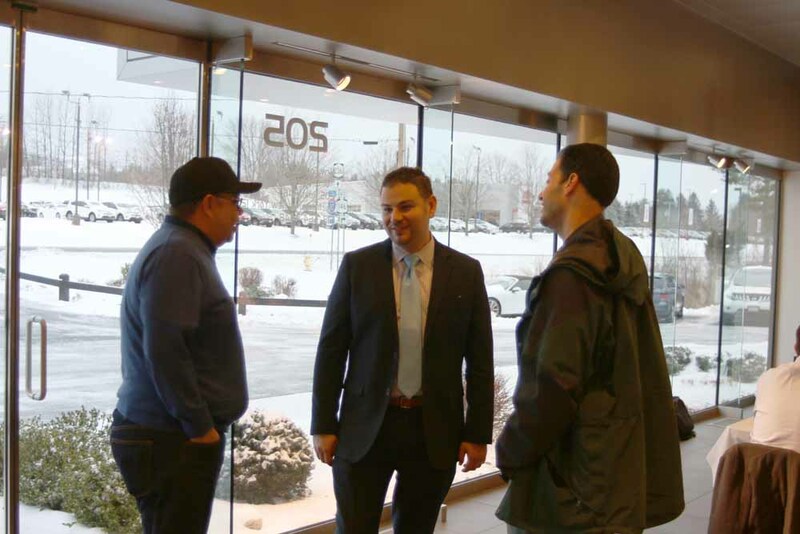 It was business like and very comfortable and the construction materials were better than I had expected. The truth is, I had been wondering for a while what these cars were like inside and how did they drive. Now I was about to find out, and I couldn’t wait. The push button start brought the car to life almost instantly, so quick it surprised me and almost simultaneously seduced me with the low growl of the big American V8. (Here’s where I’d insert a smiley face if I knew how to do it in Word.) The car starts to move easily and smoothly. We had to drive city streets for a short while till we got to a stretch of open road, where I could accelerate and get an idea of the power curve. It comes on strong and quick and well, the car is fast. It’s faster than mine and I’m liking it! I sure am grinning. 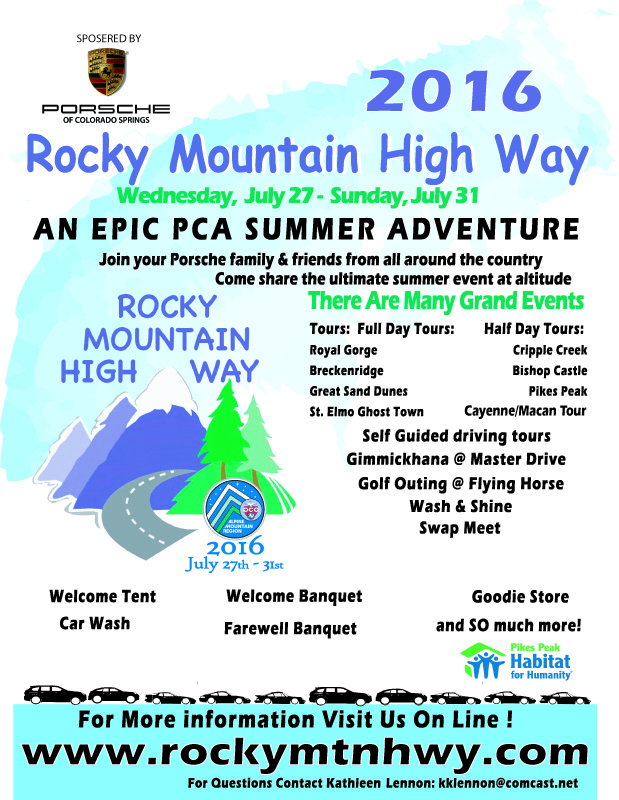 The Alpine Mountain Region PCA is offering Porsche owners an opportunity to drive through the Rockies this summer. In support or our sister club, here’s an announcement of their event. 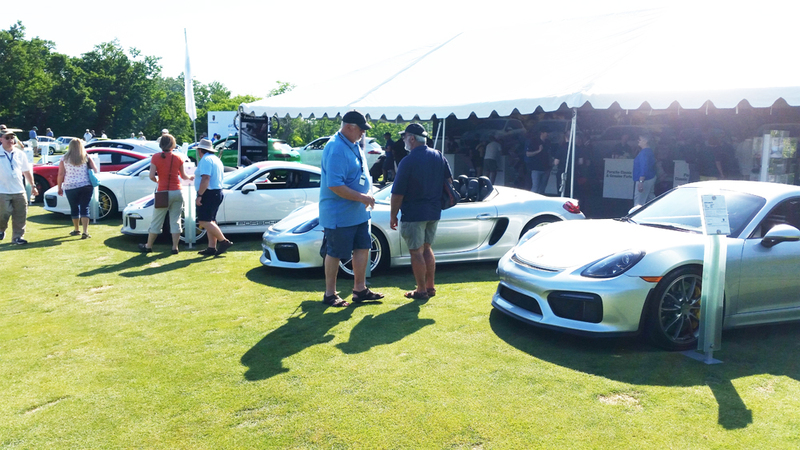 Join your Porsche friends from all over in Colorado’s high country for the ultimate summer escape. 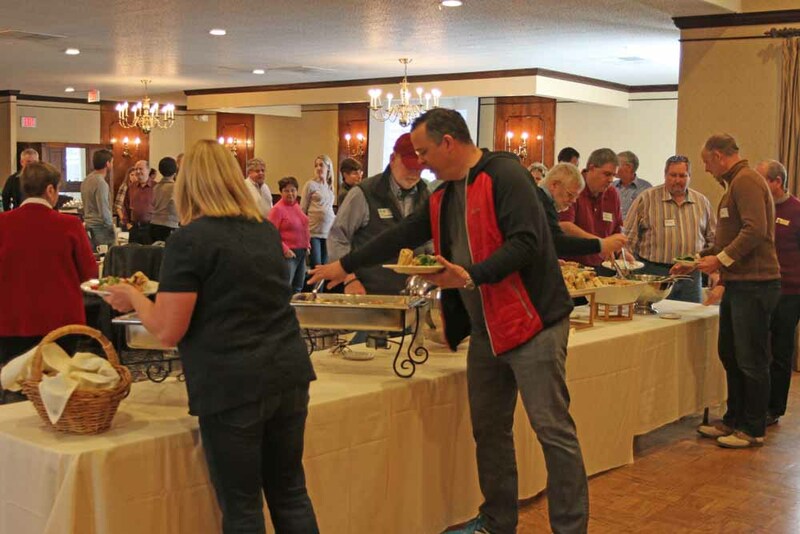 Wash & Shine, Golf, Banquets and much, much more! See website or contact Kathleen Lennon at kklennon@comcast.net for more details! Registration and website (www. rockymtnhwy.com) go live January 1, 2016! 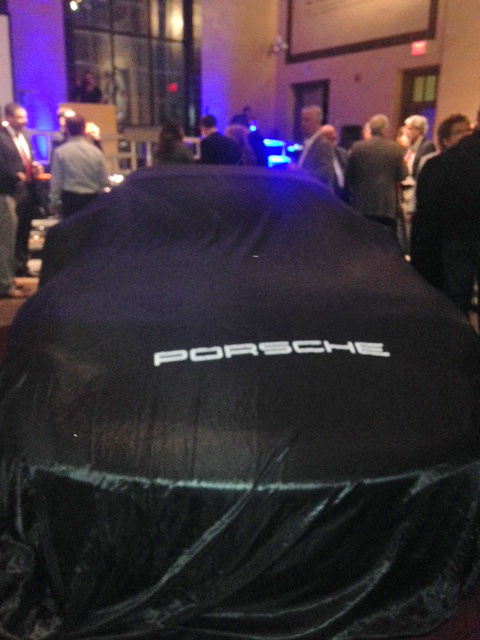 HCP’s 2016 season kicks off with the year’s first Drive & Dine, brunch at Prime at Saratoga National Golf Course on Sunday, January 31st.. 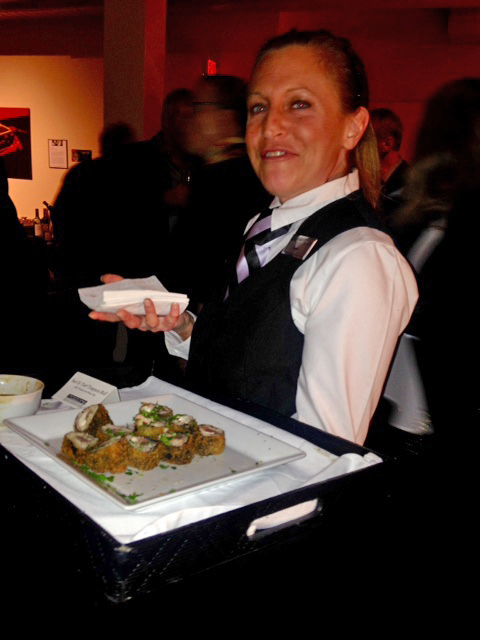 The cost will be $35pp for the most amazing buffet in town. 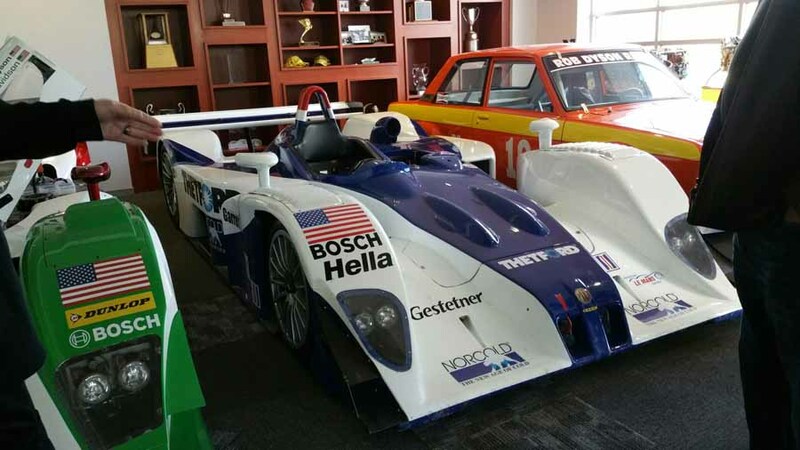 And as an added bonus, activities chair Louis Dahoda has arranged for a large screen TV in our private dining room so we can watch the finish of the Rolex 24 at Daytona, North America’s premier sports car event. Watch the race or don your coat and enjoy some cheer around the outdoor firepit. Watch Open Roads in January for more details.